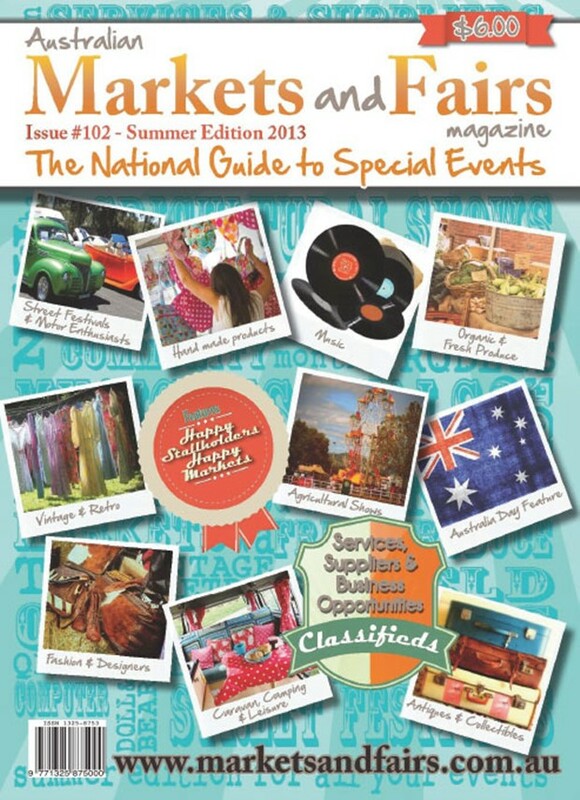 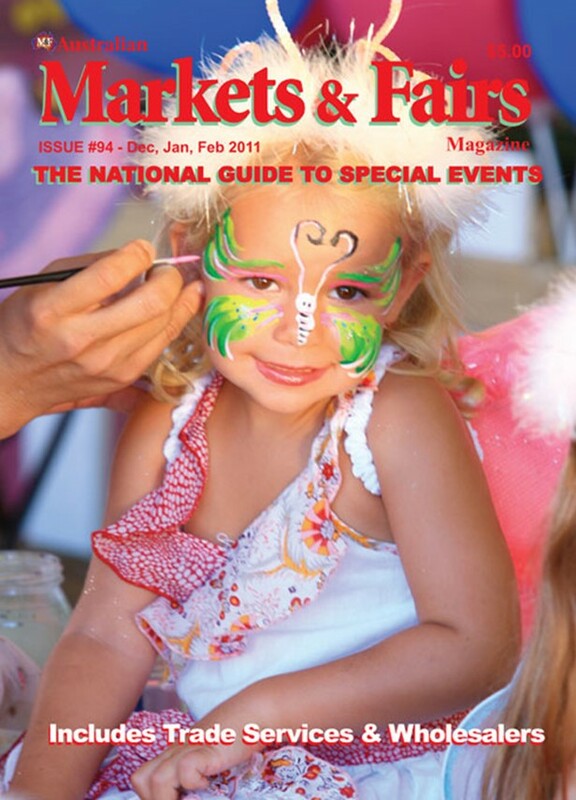 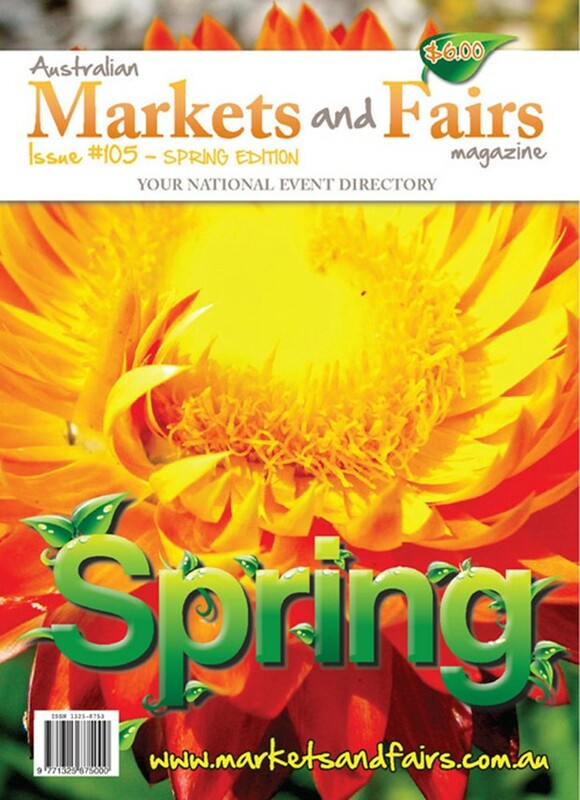 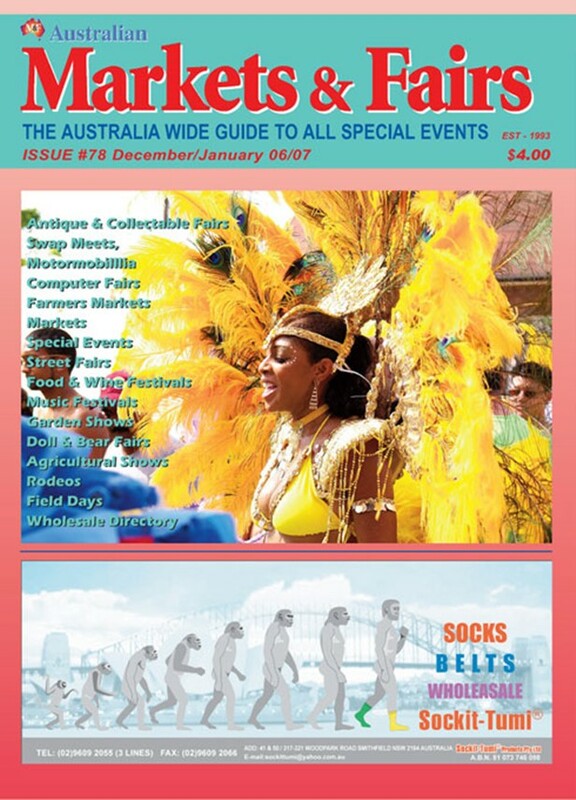 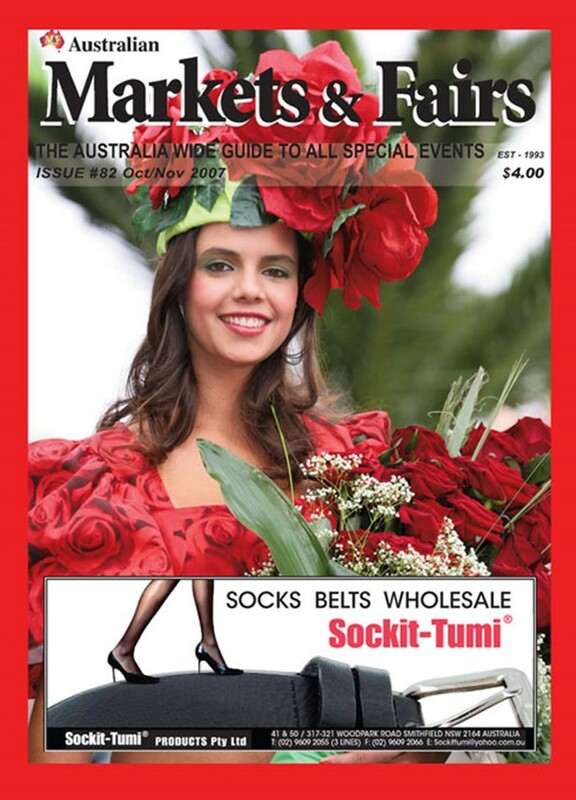 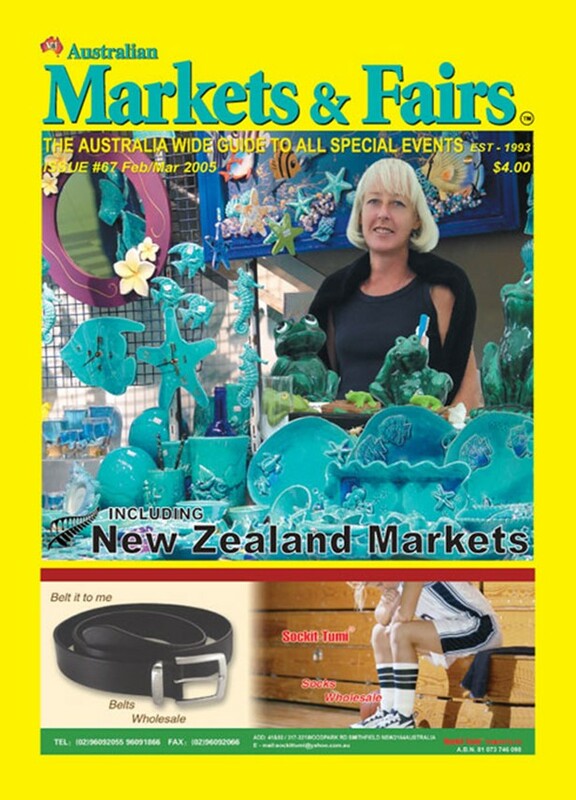 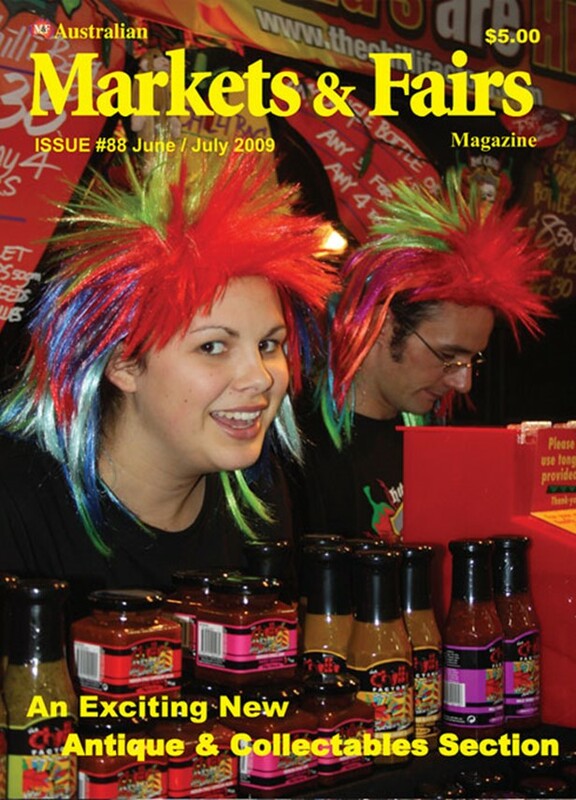 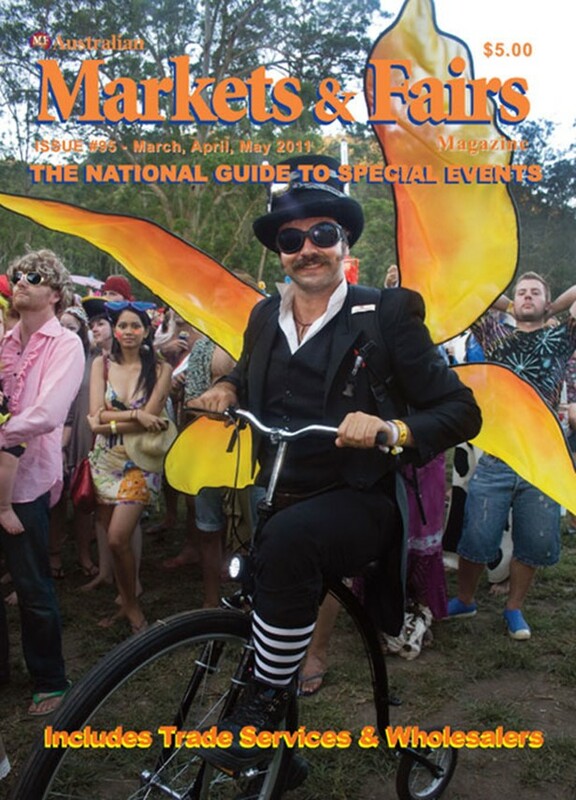 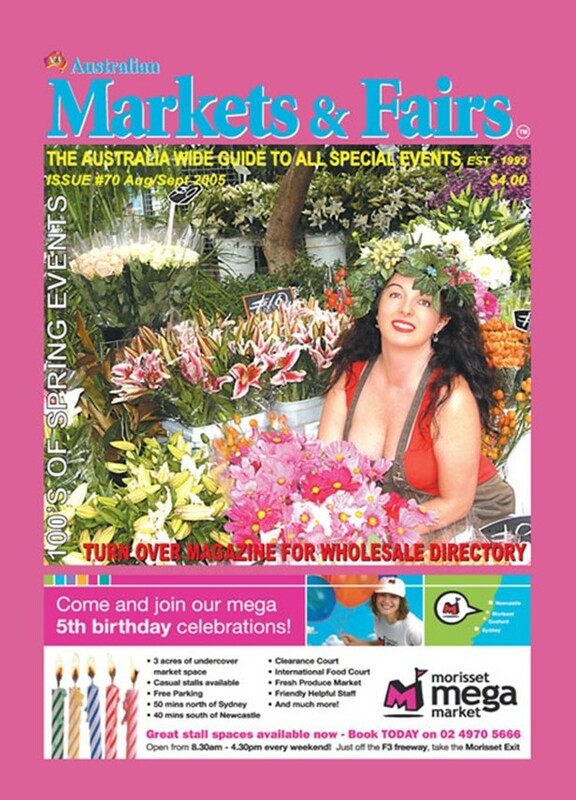 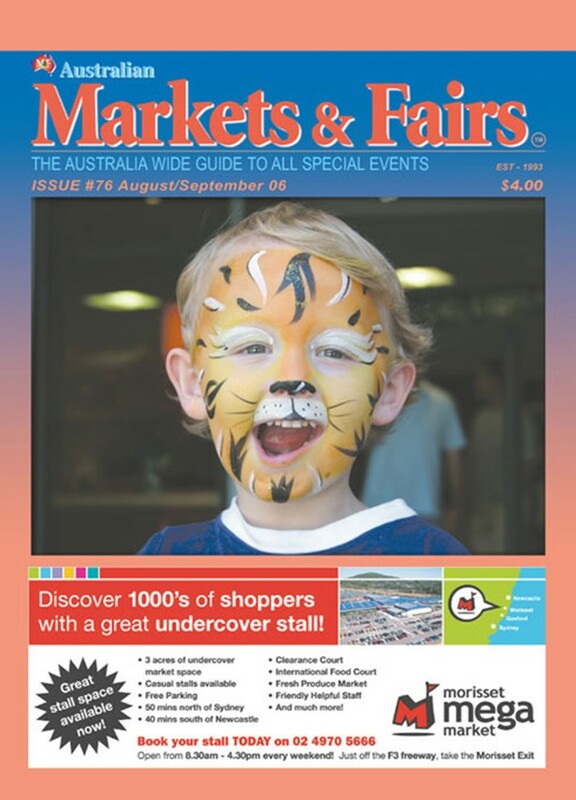 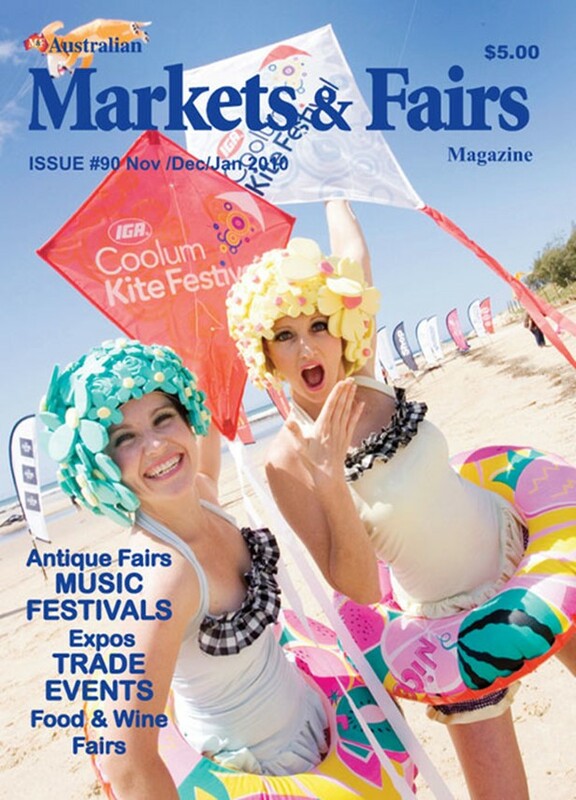 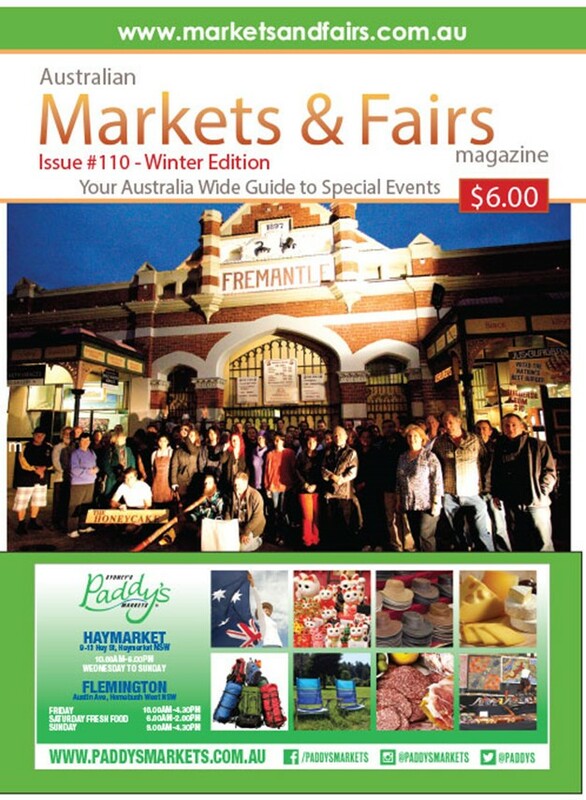 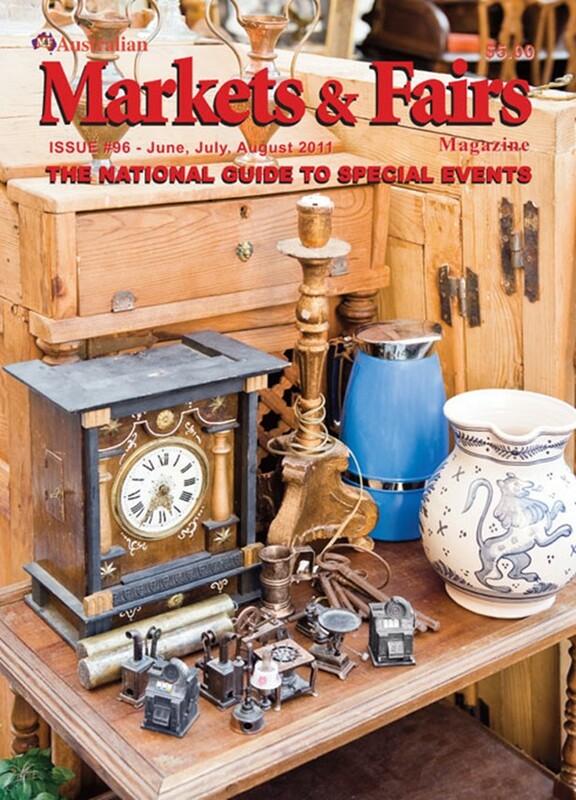 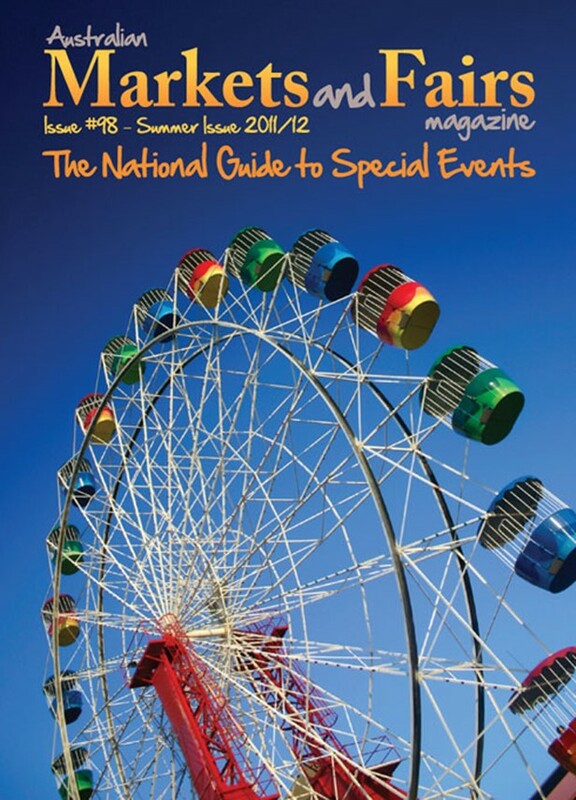 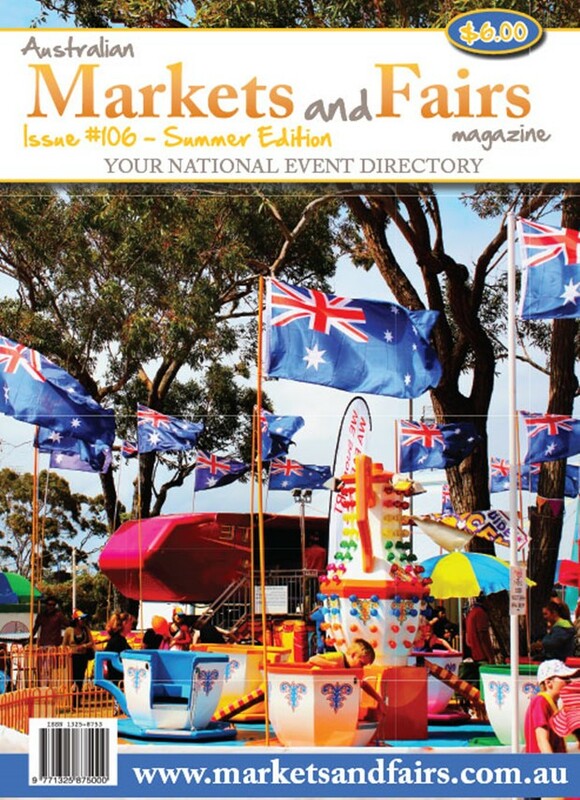 Australian Markets and Fairs Magazine is now in its 25th year of circulation. 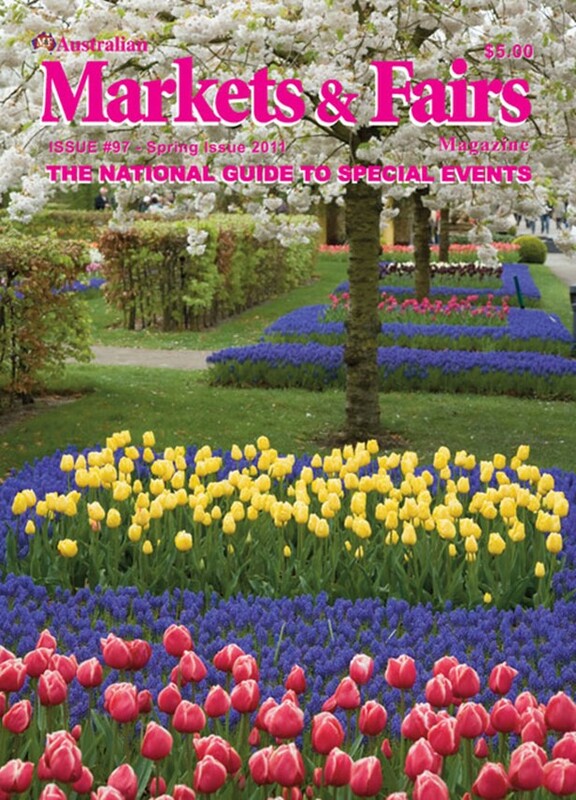 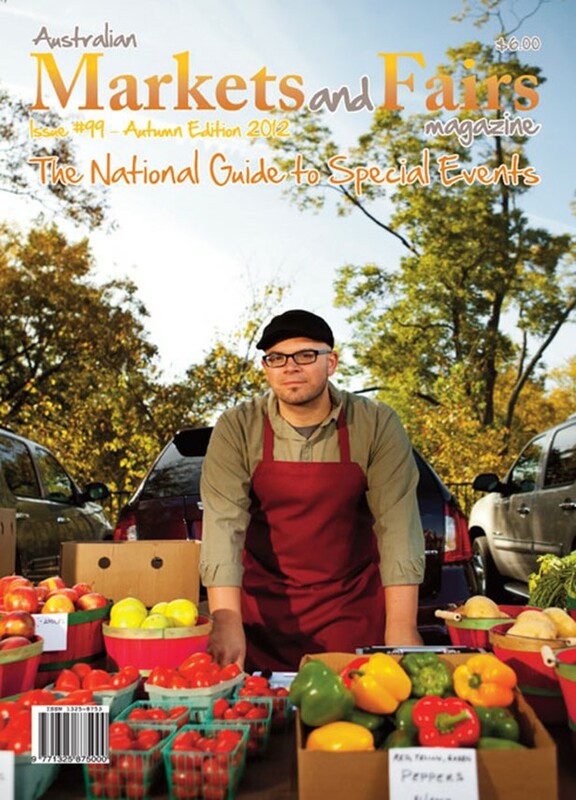 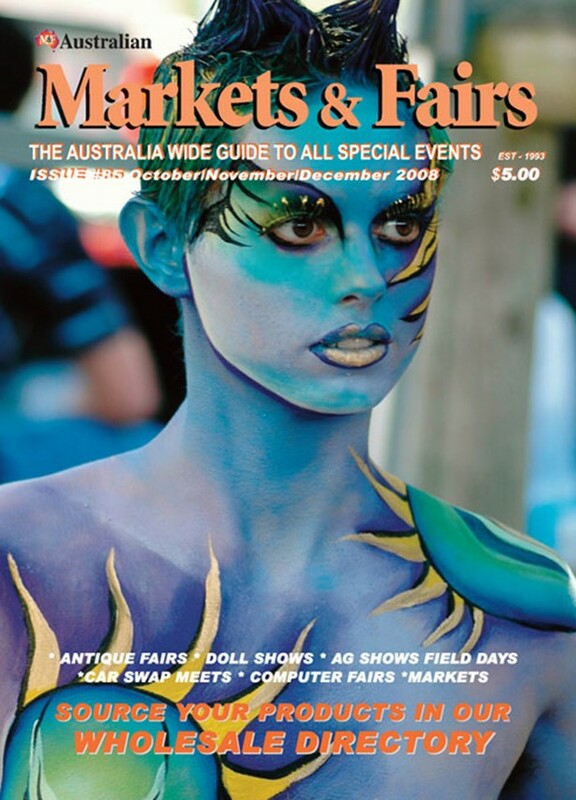 The magazine is a 124 page comprehensive national guide to Markets and Events, also with a wholesale section ranging from insurance to traders required for Markets and Events. 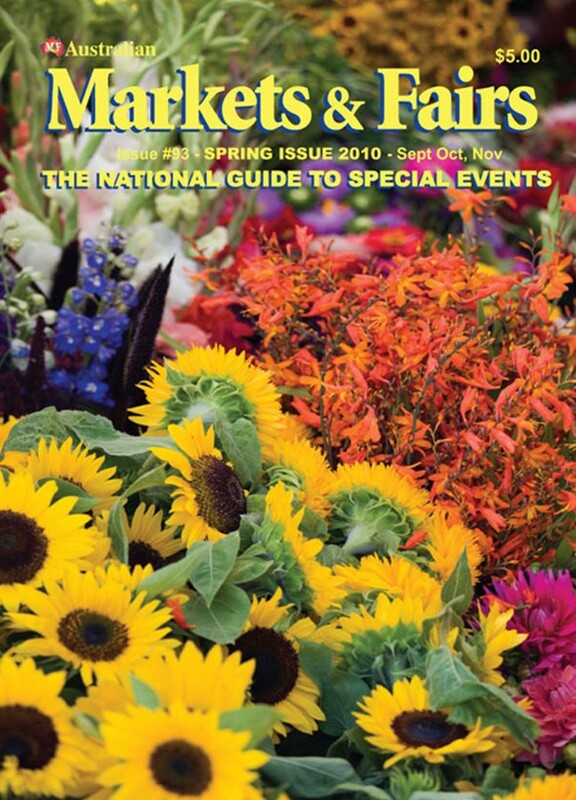 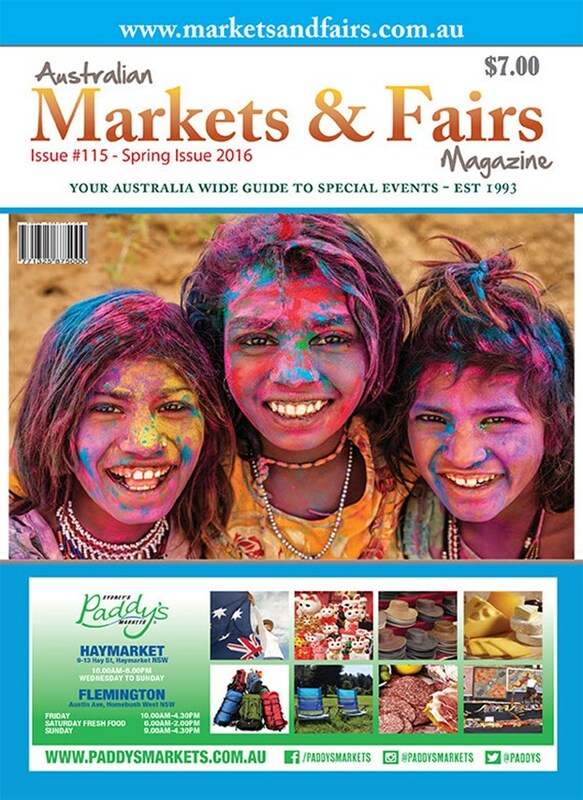 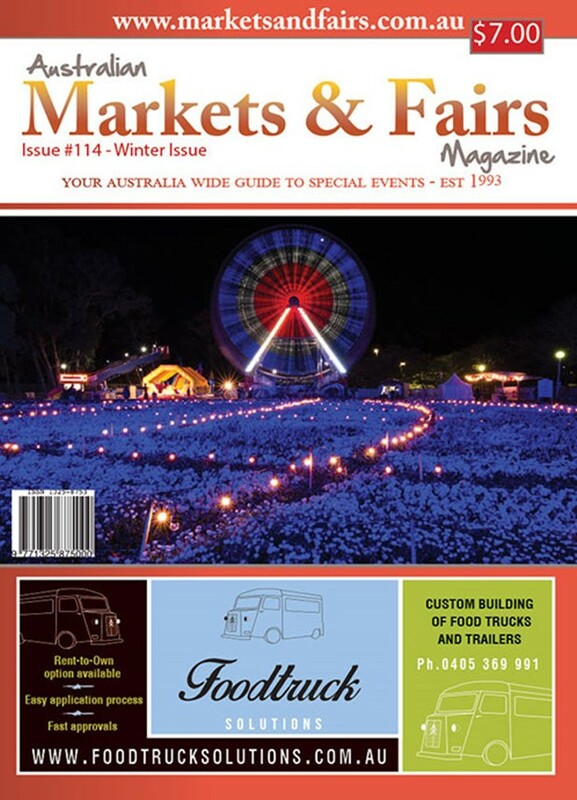 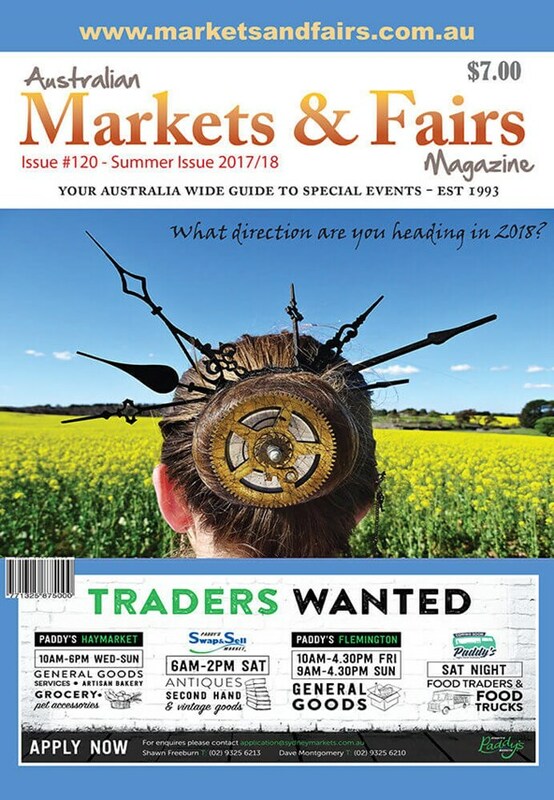 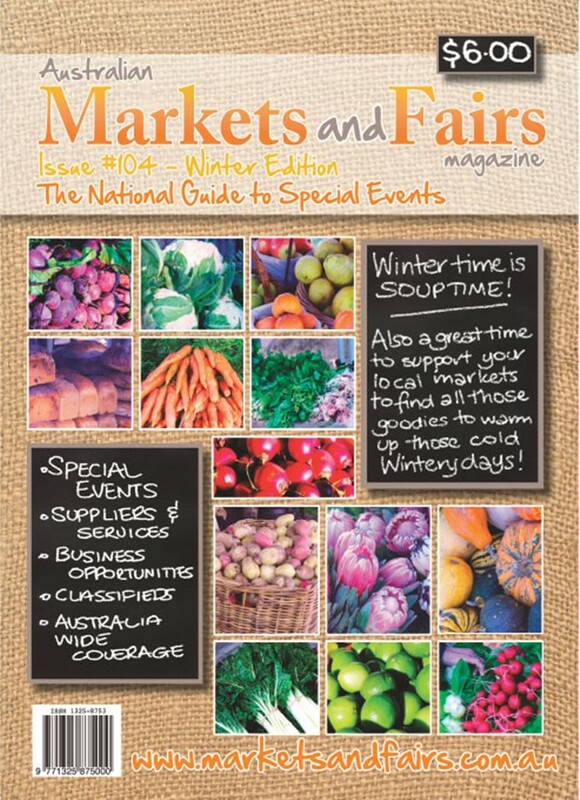 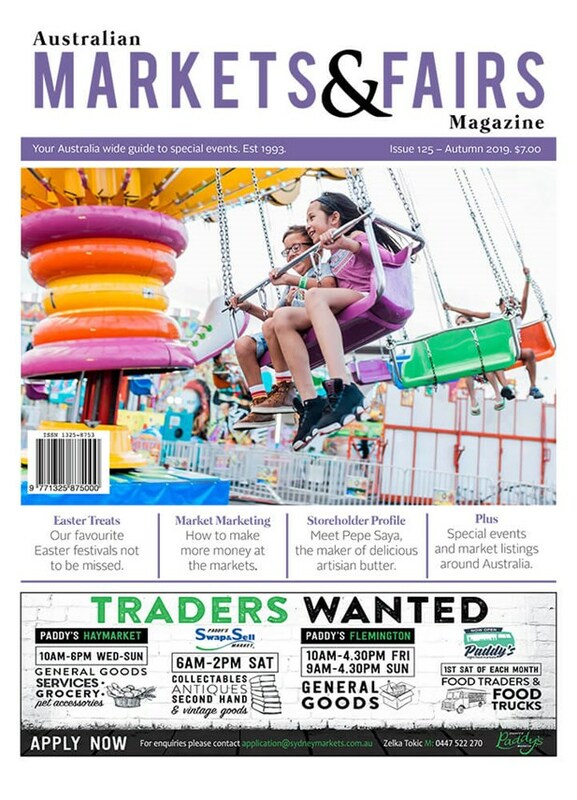 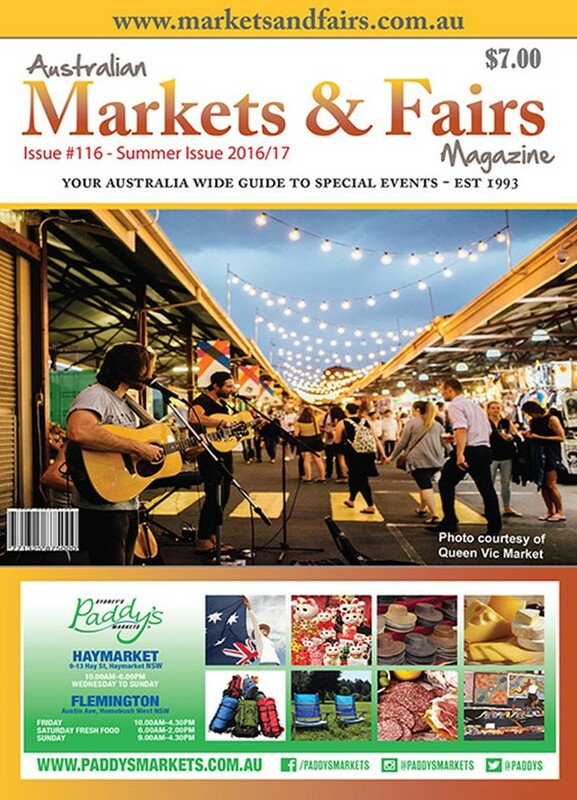 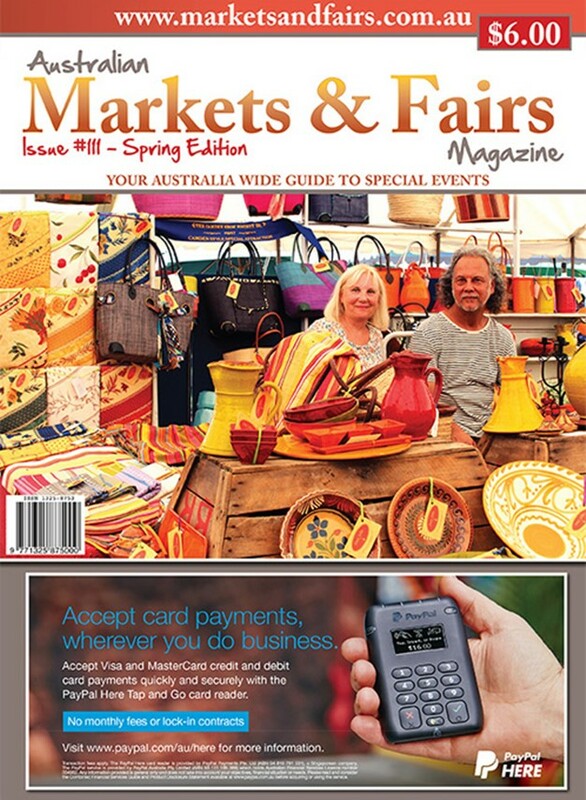 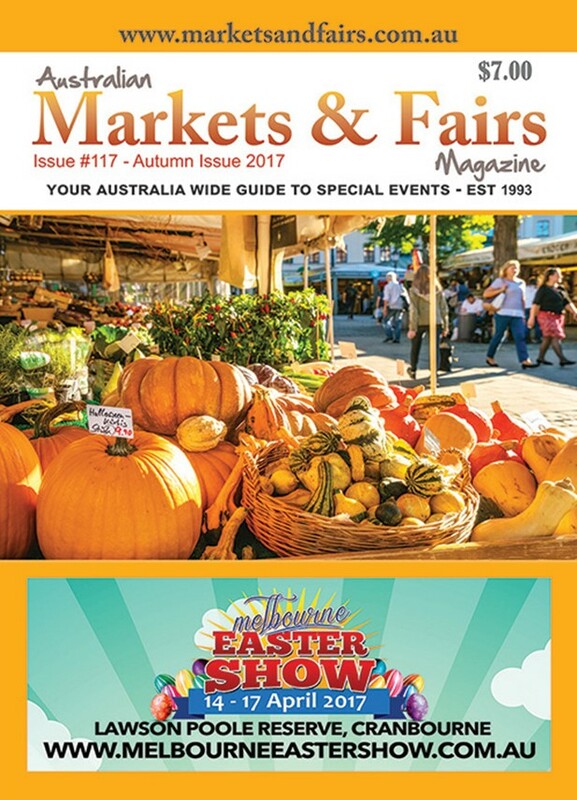 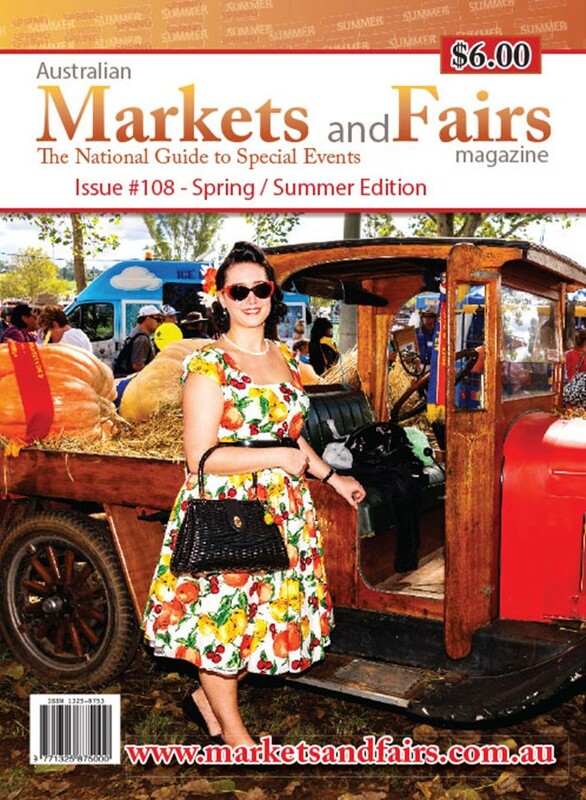 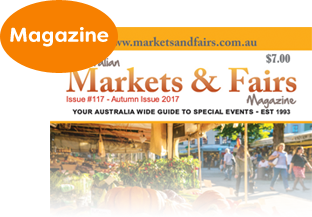 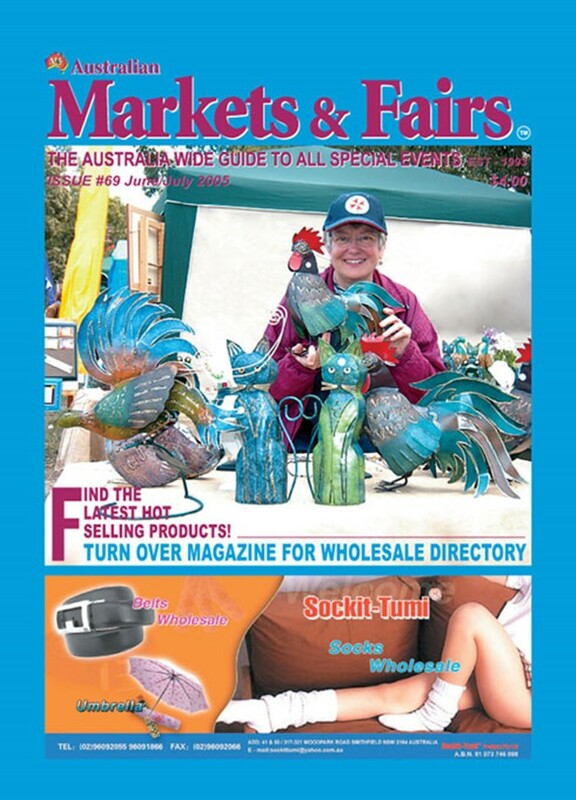 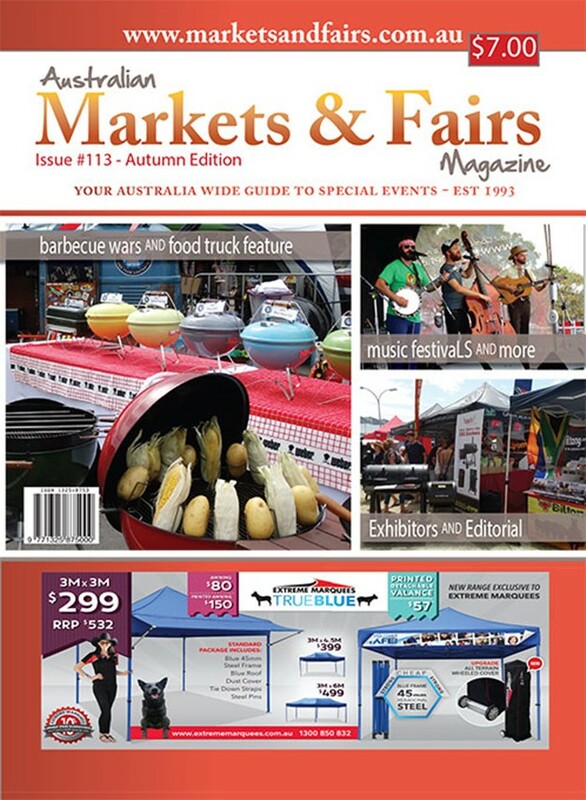 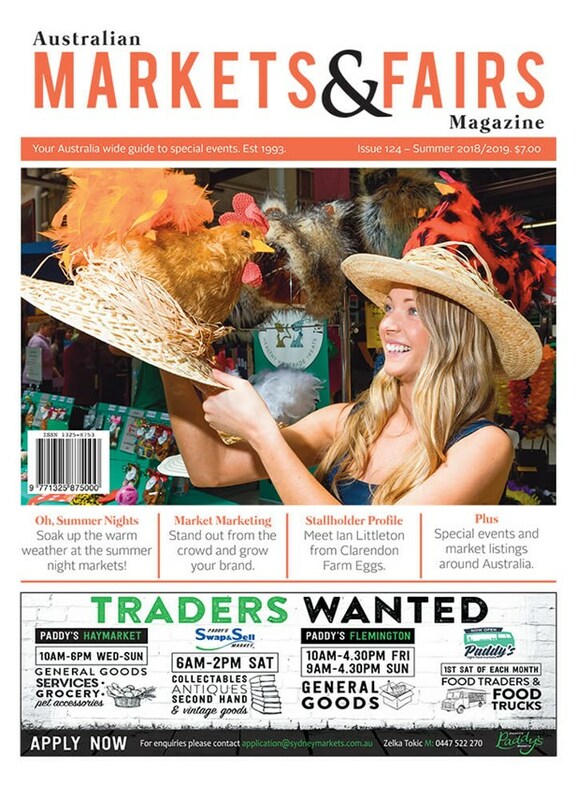 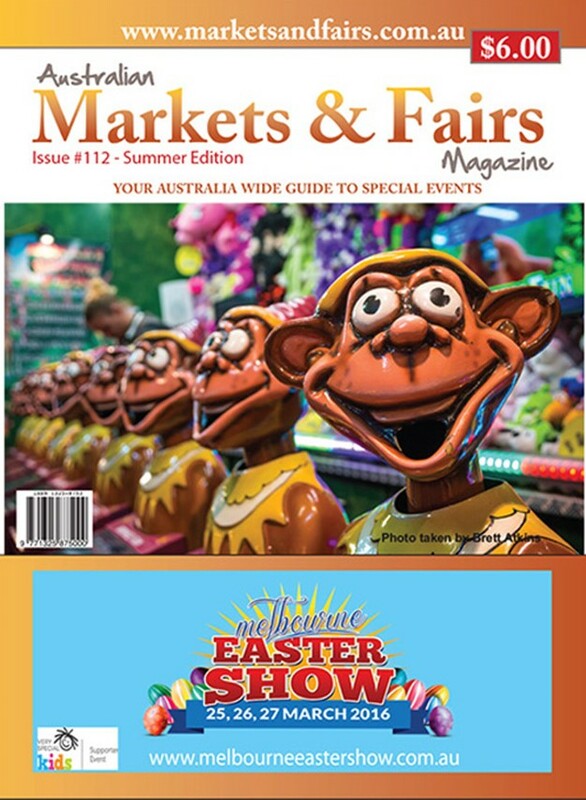 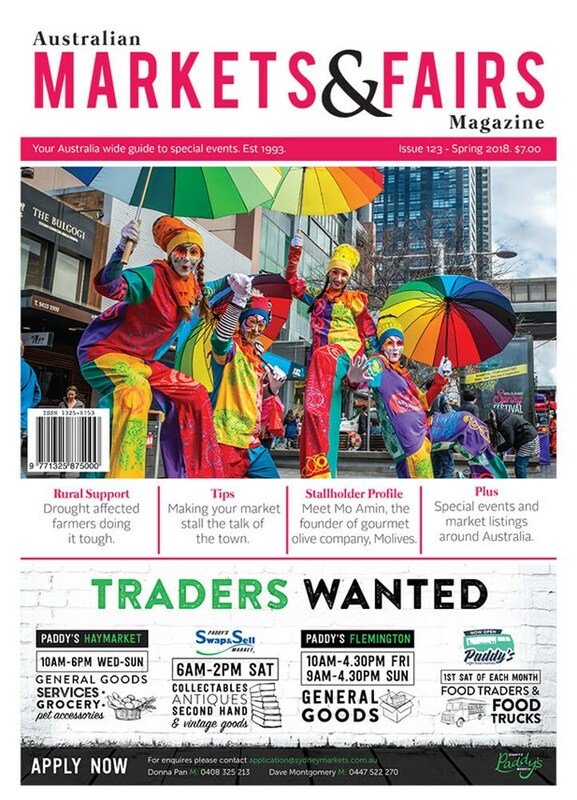 Published and distributed quarterly, the Australian Markets and Fairs Magazine is available from newsagencies, via our subscription service and even at many markets through our independent distributors for as low as $7.00 incl GST. 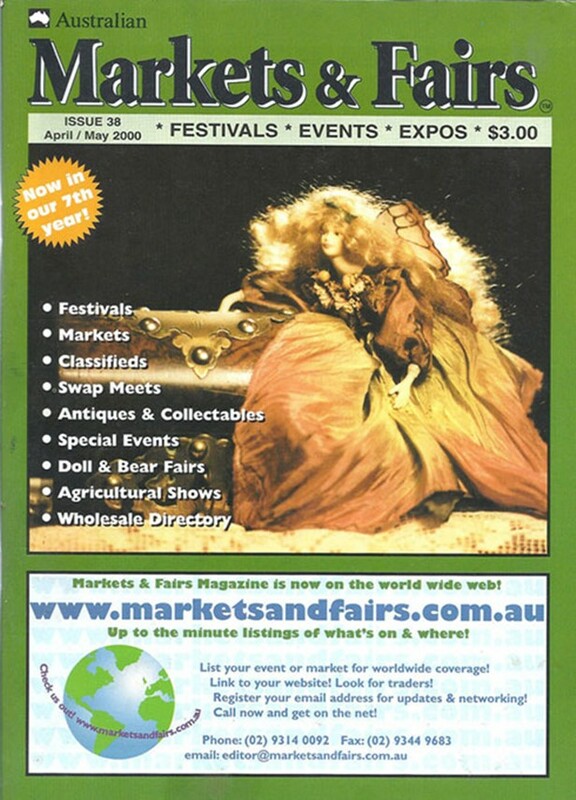 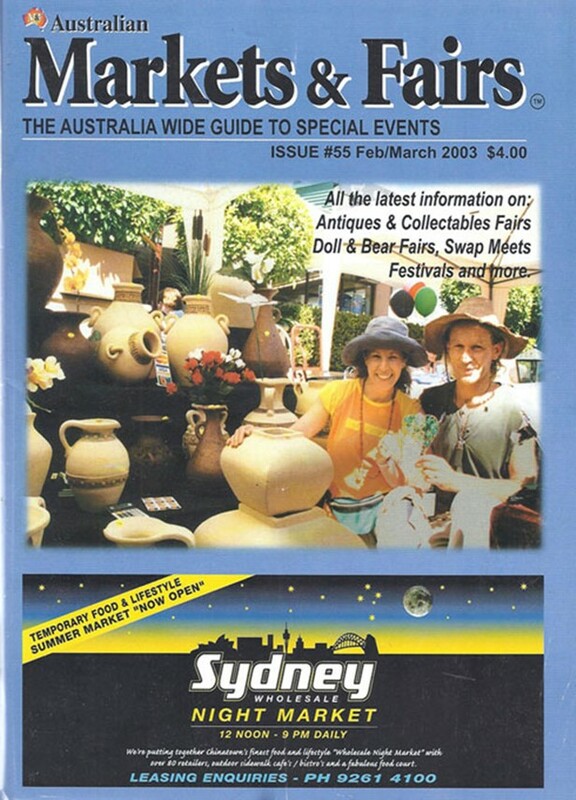 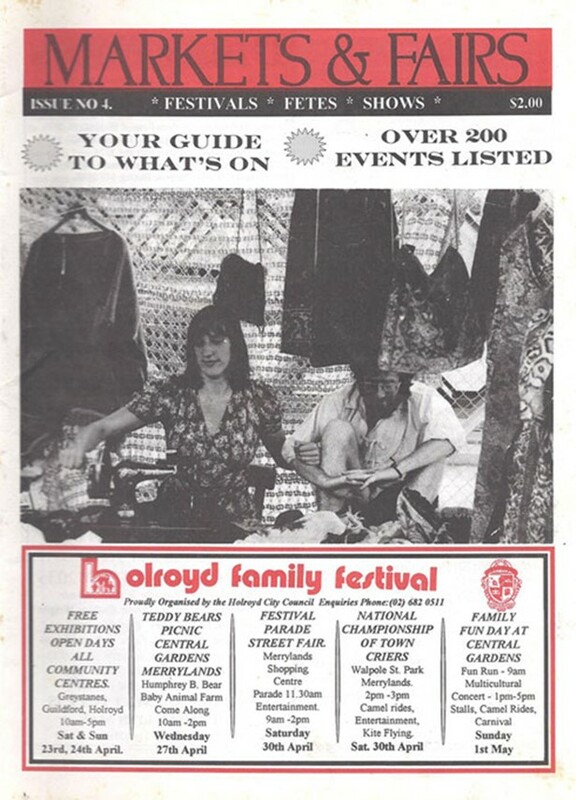 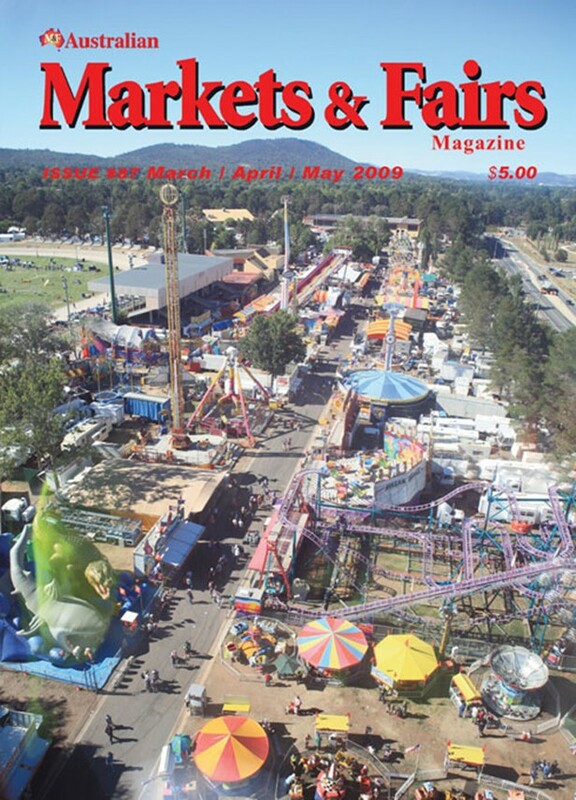 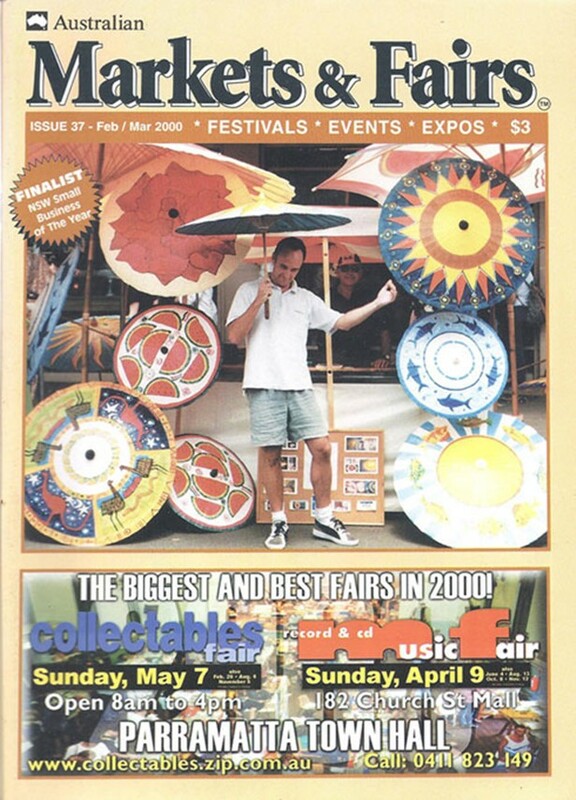 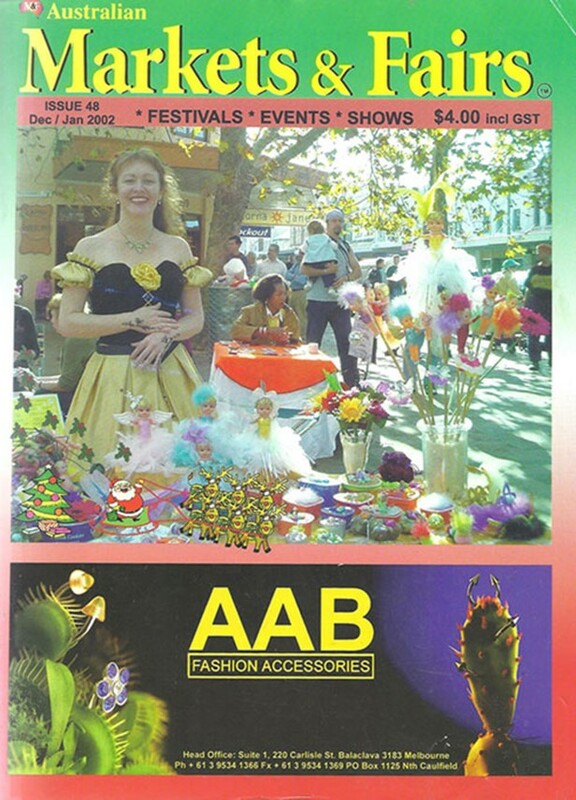 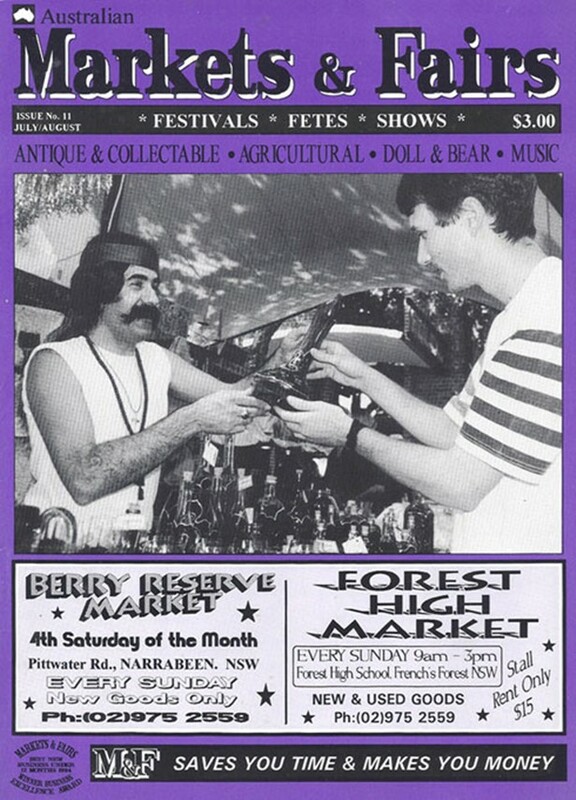 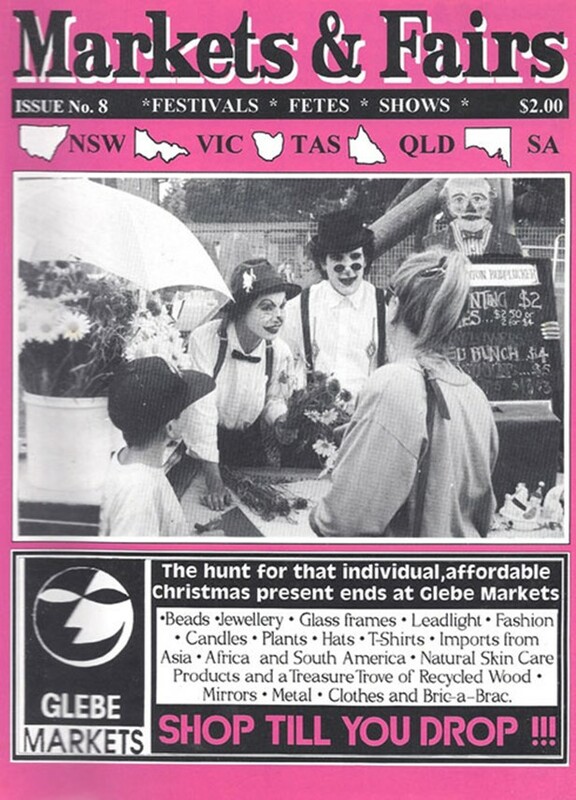 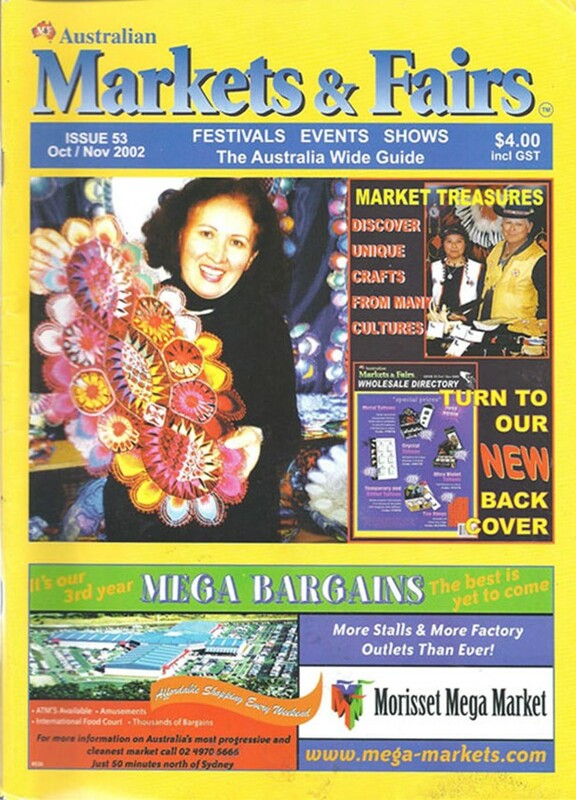 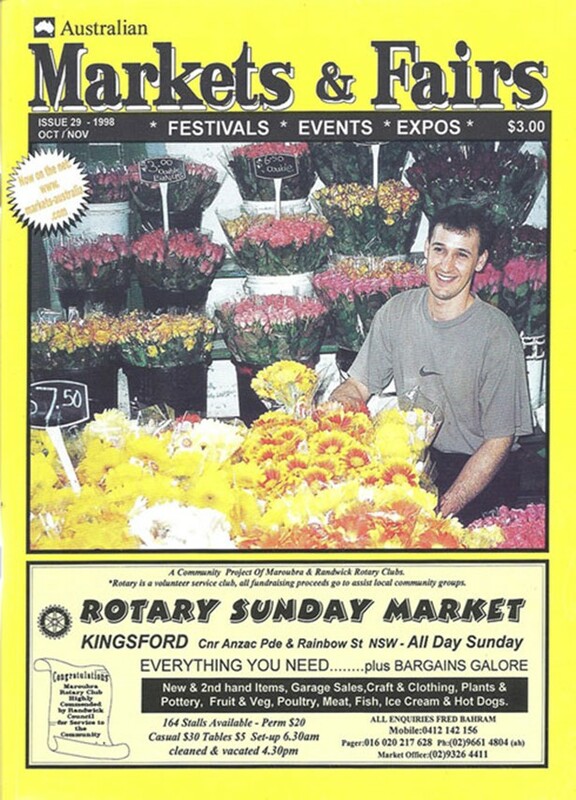 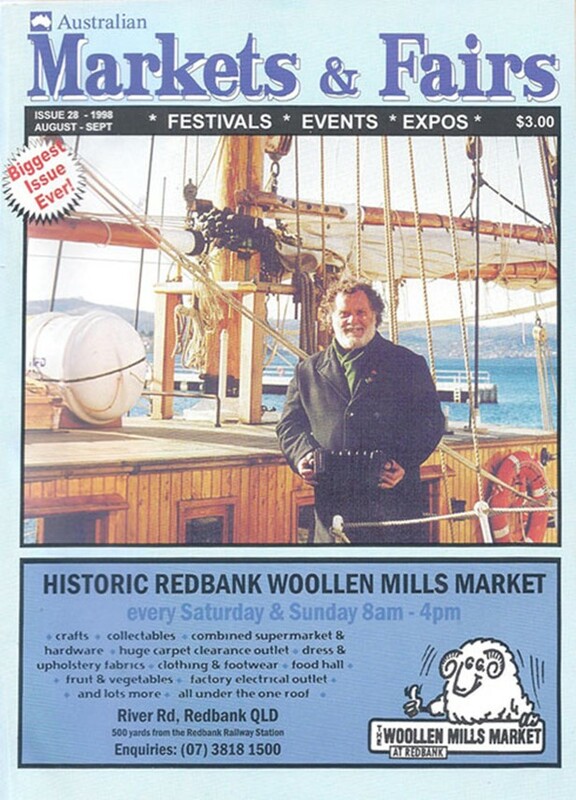 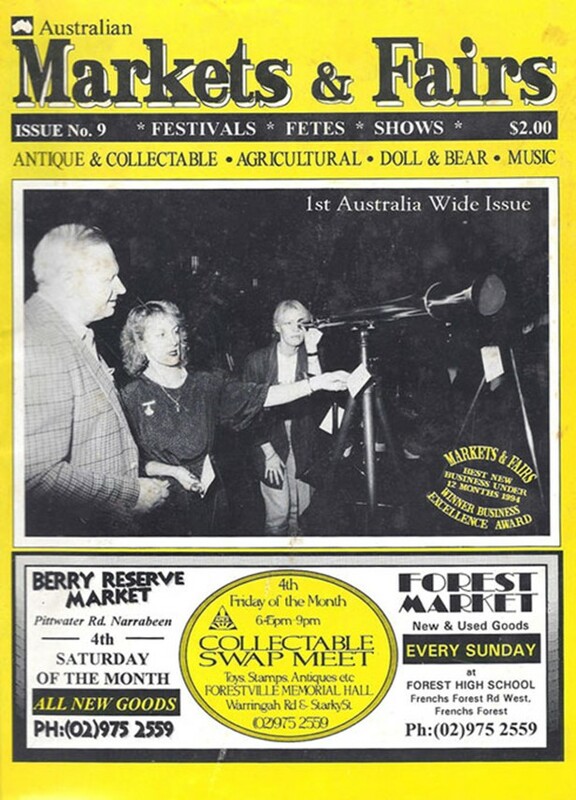 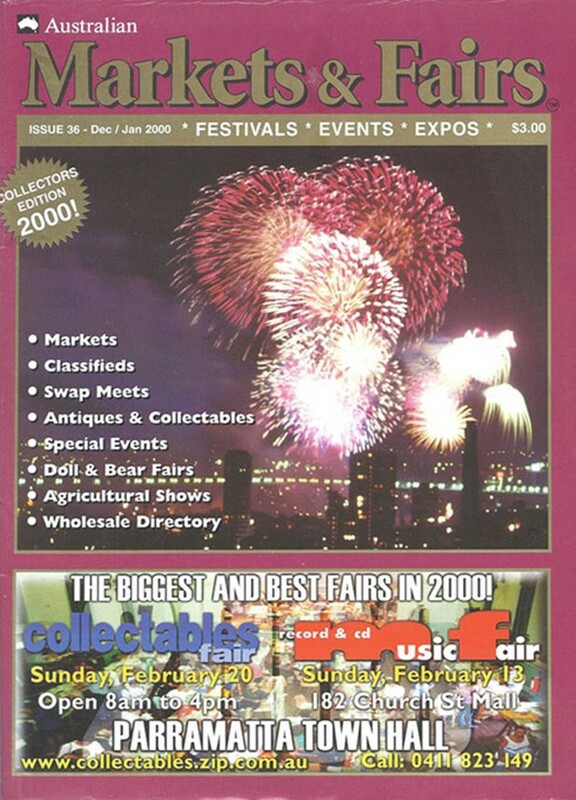 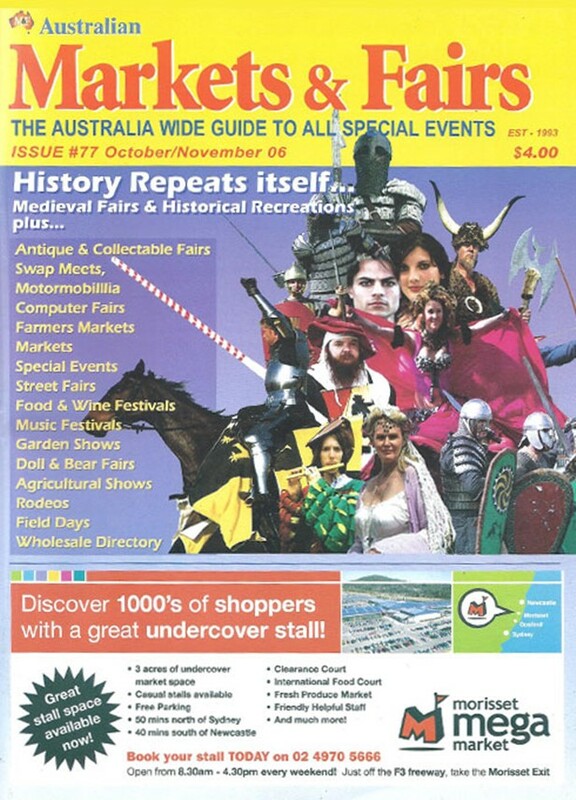 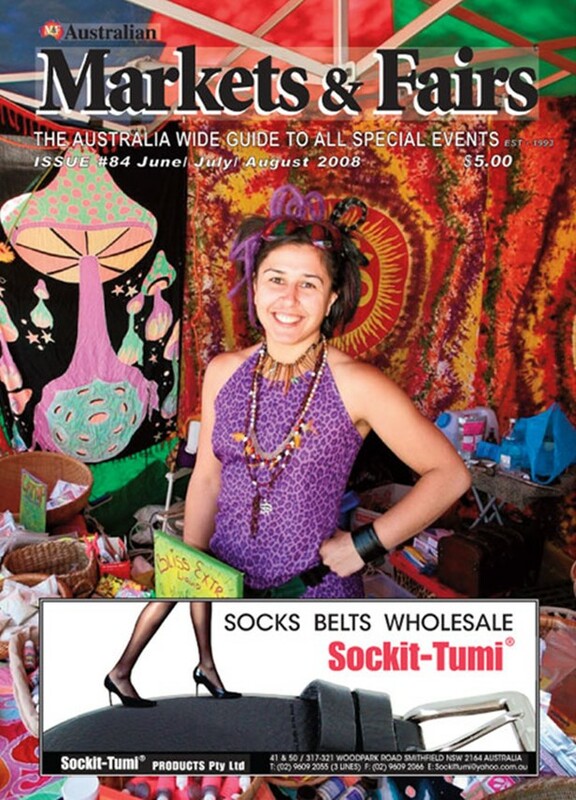 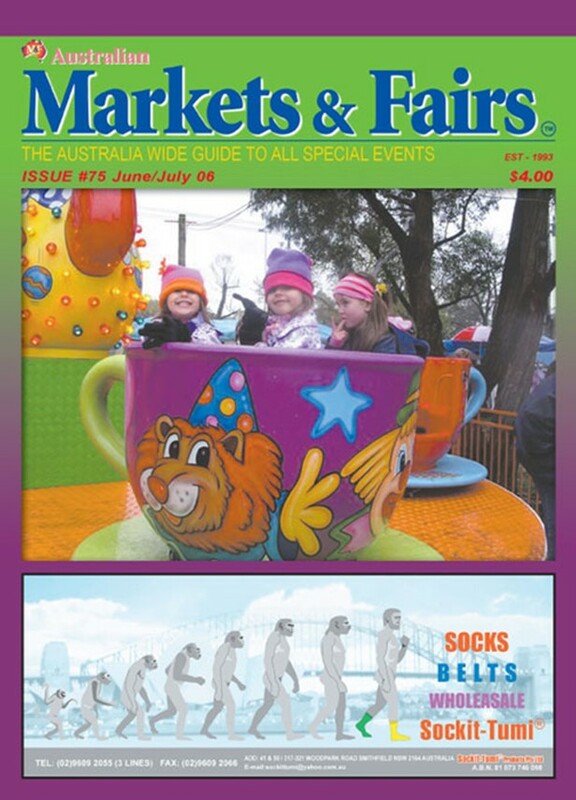 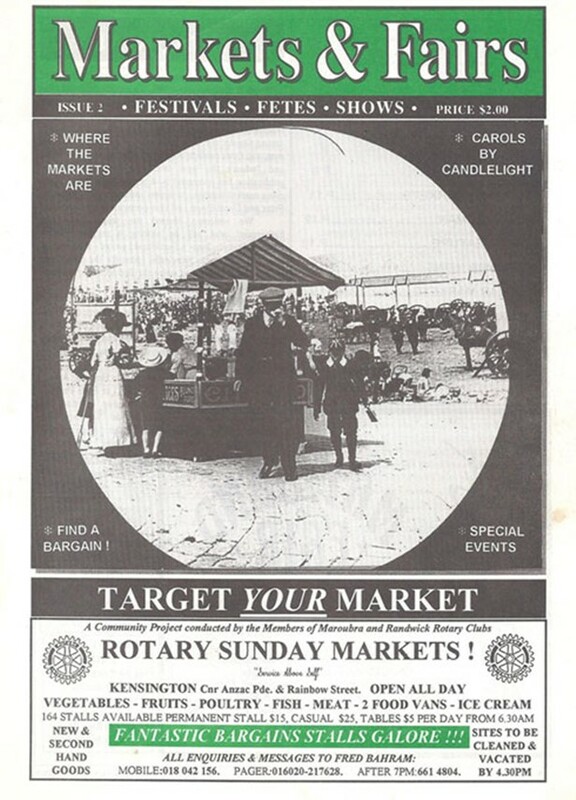 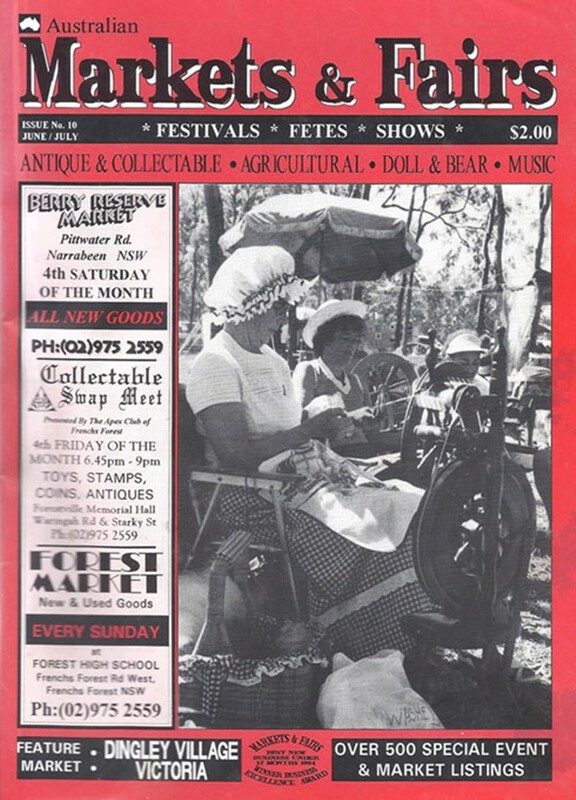 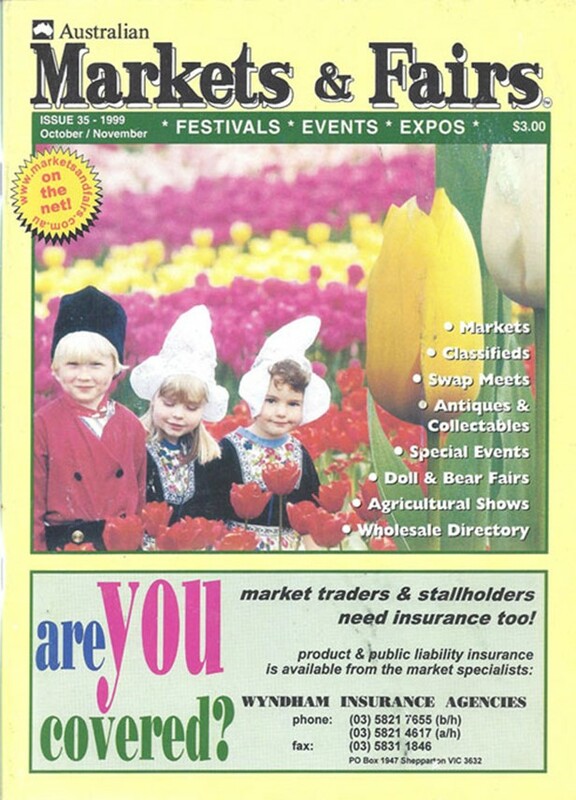 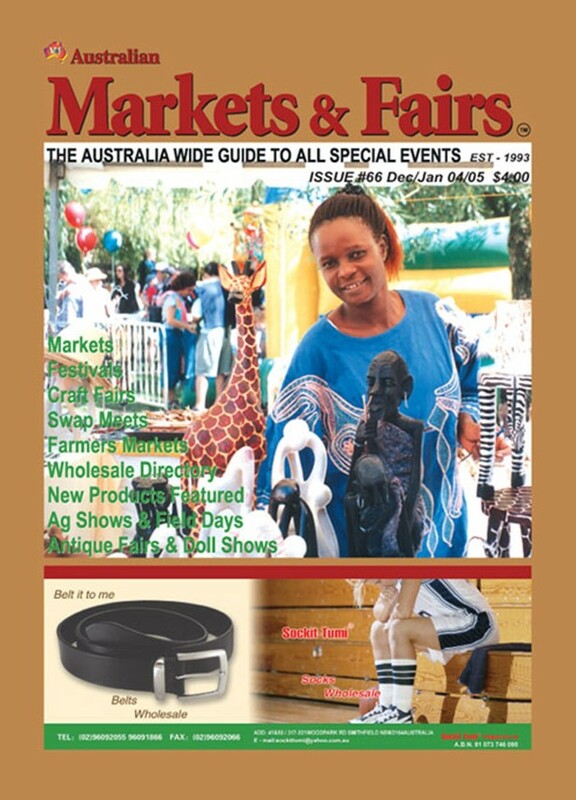 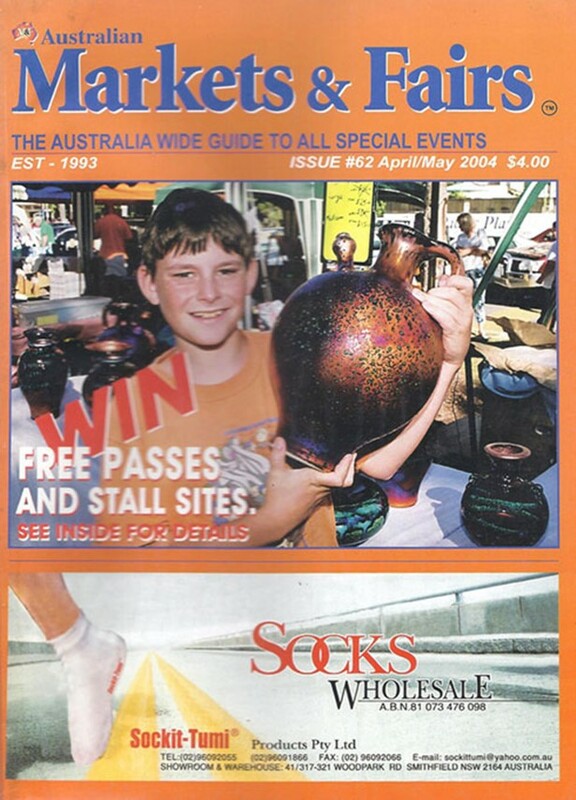 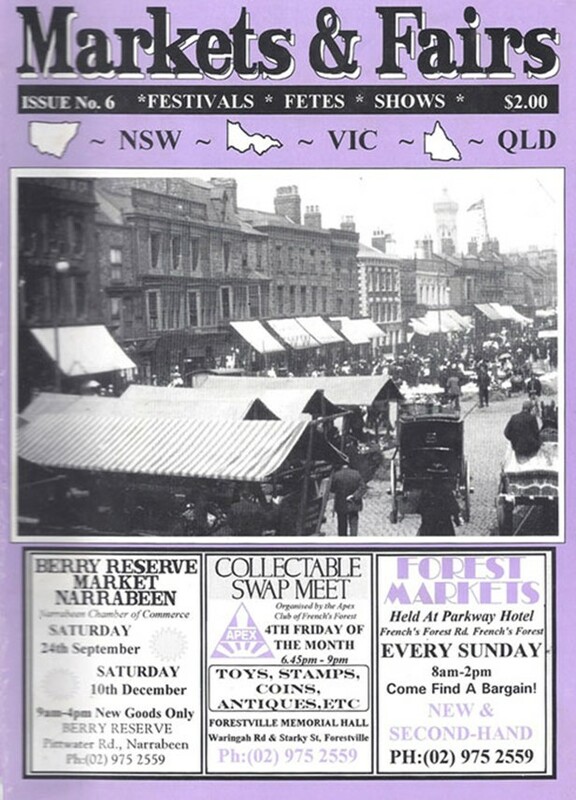 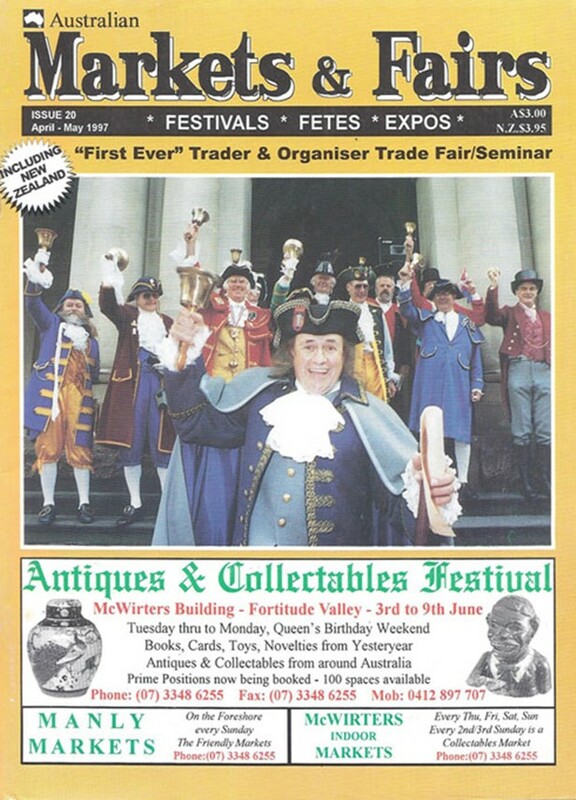 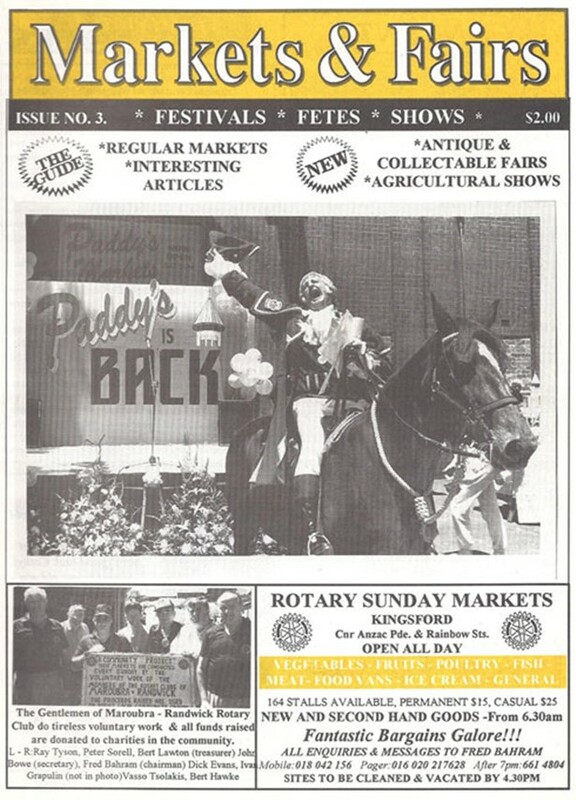 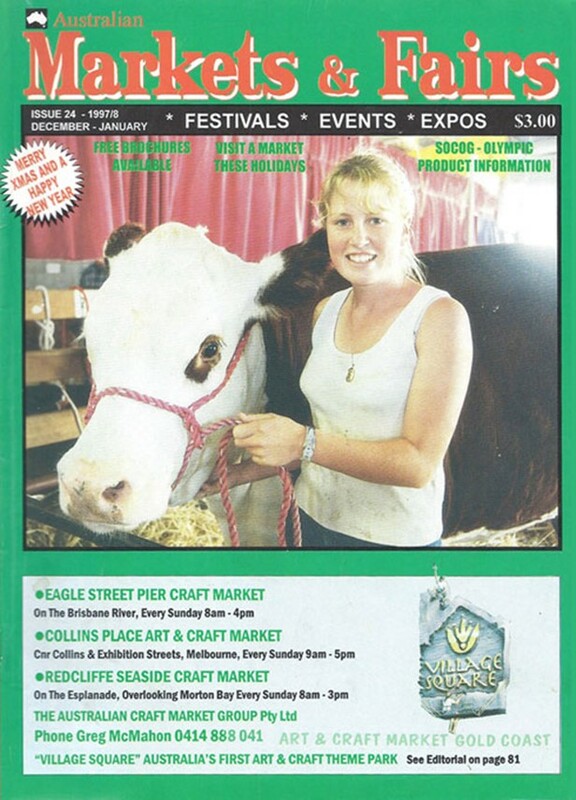 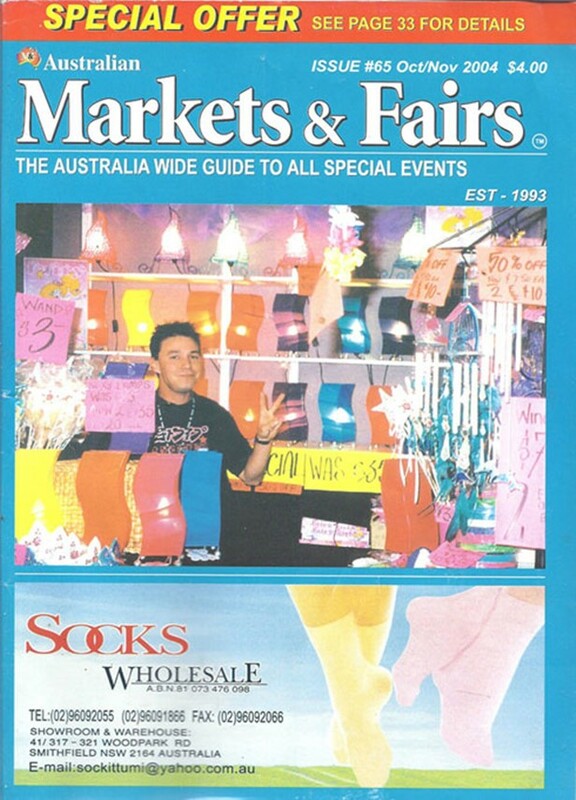 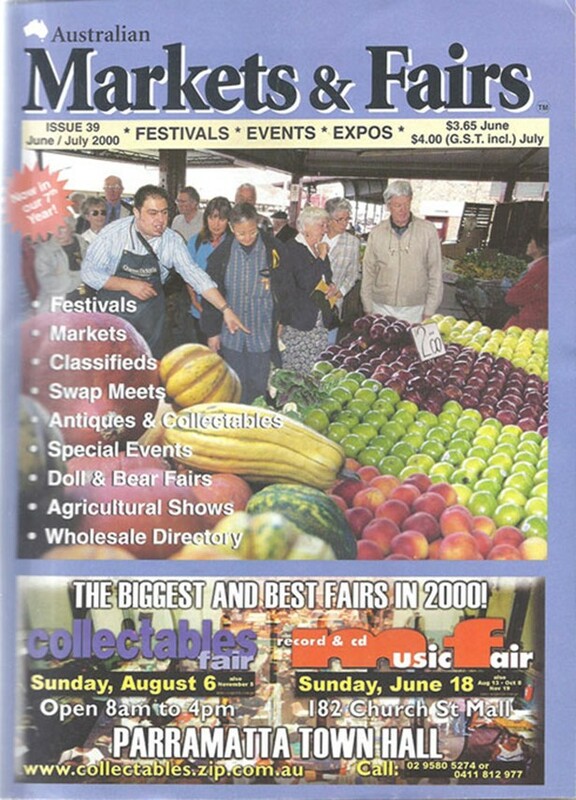 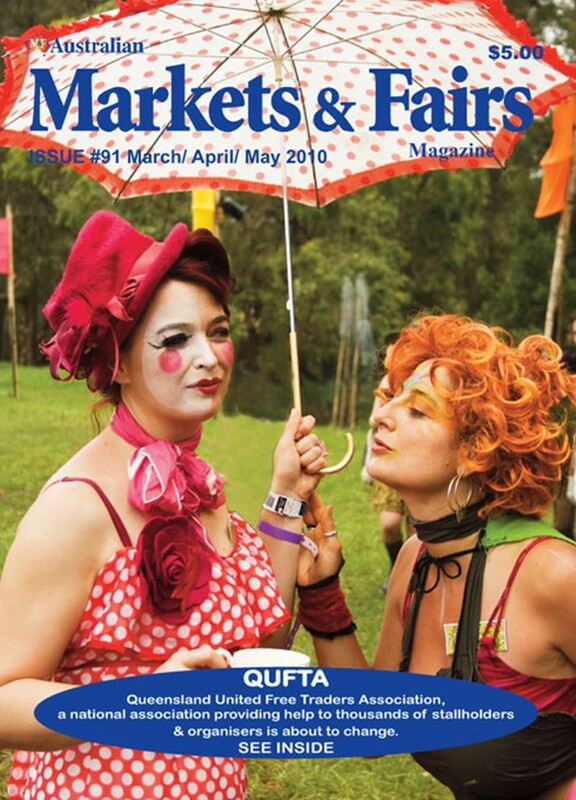 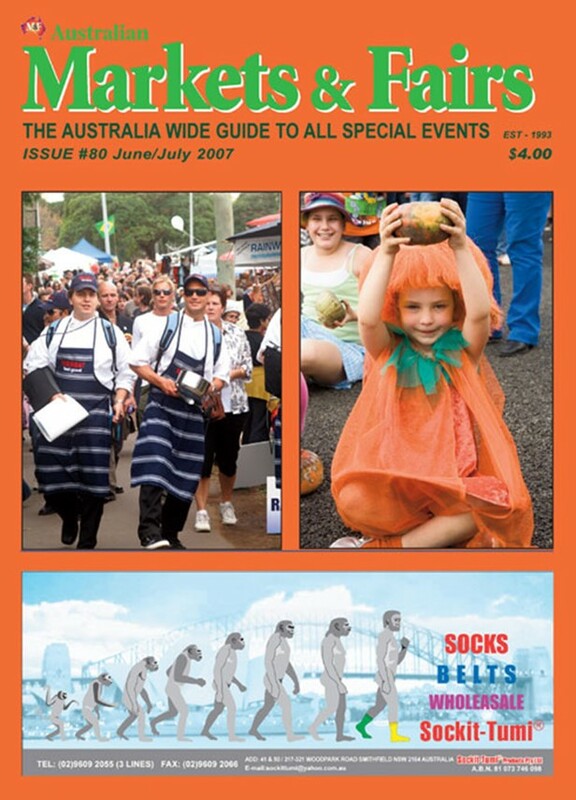 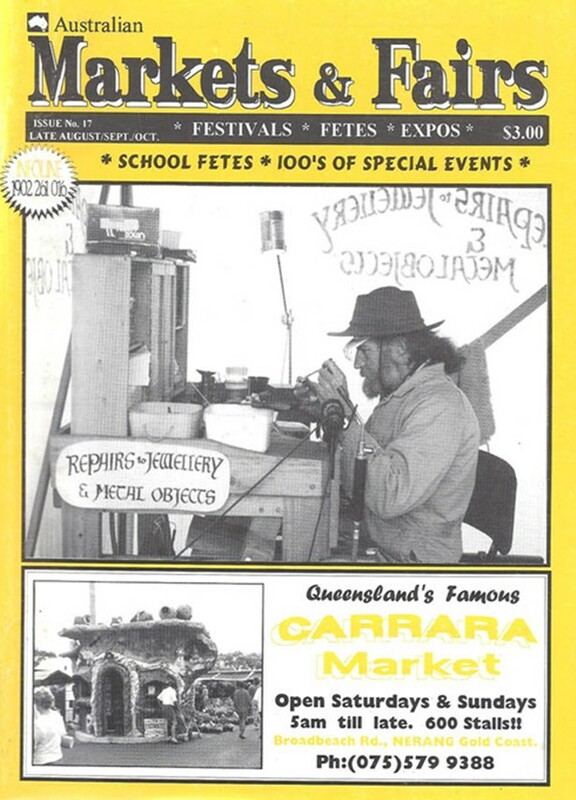 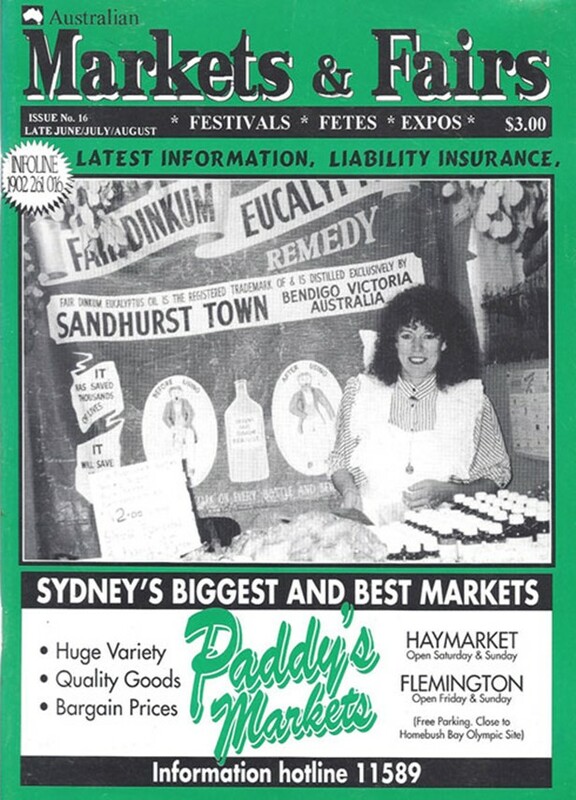 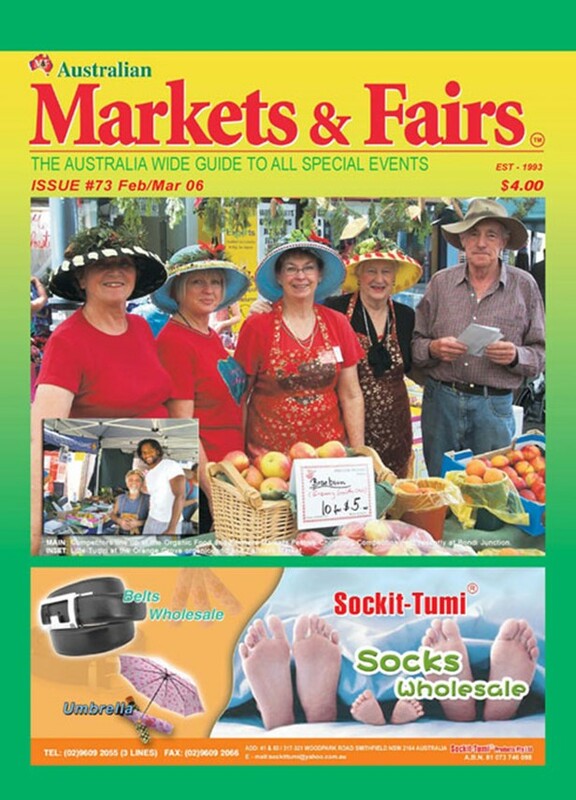 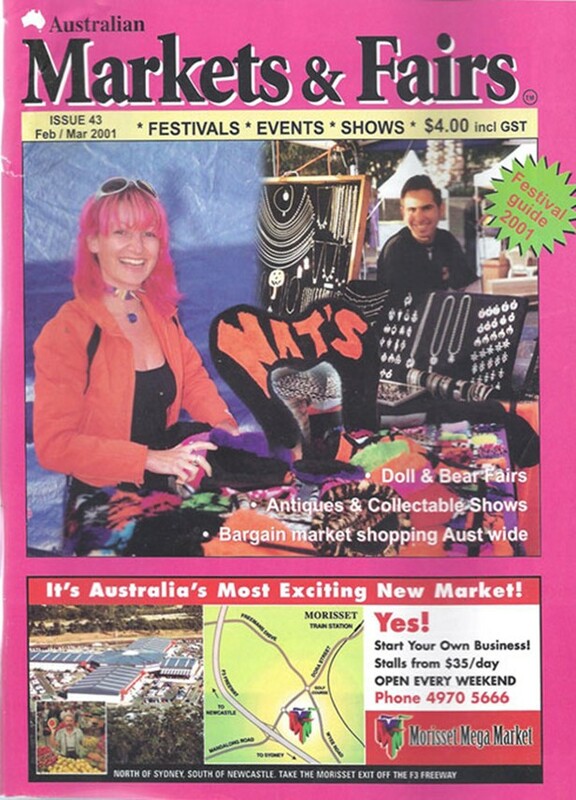 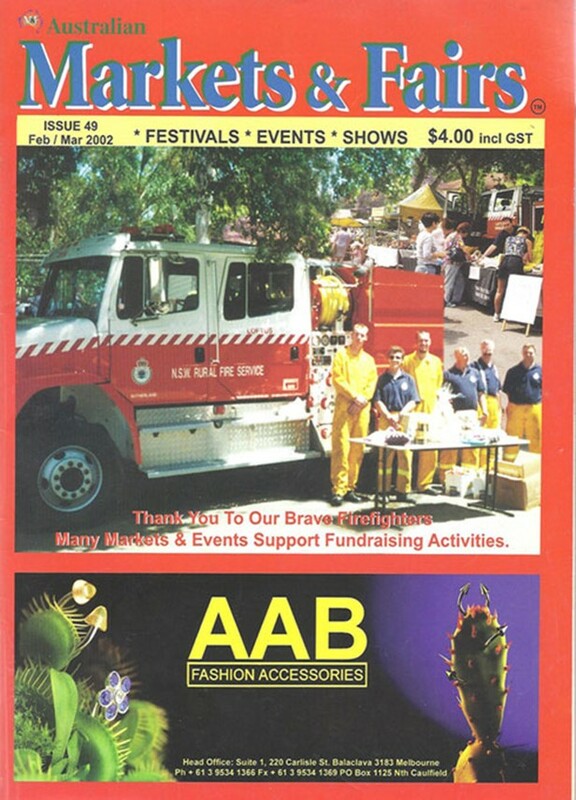 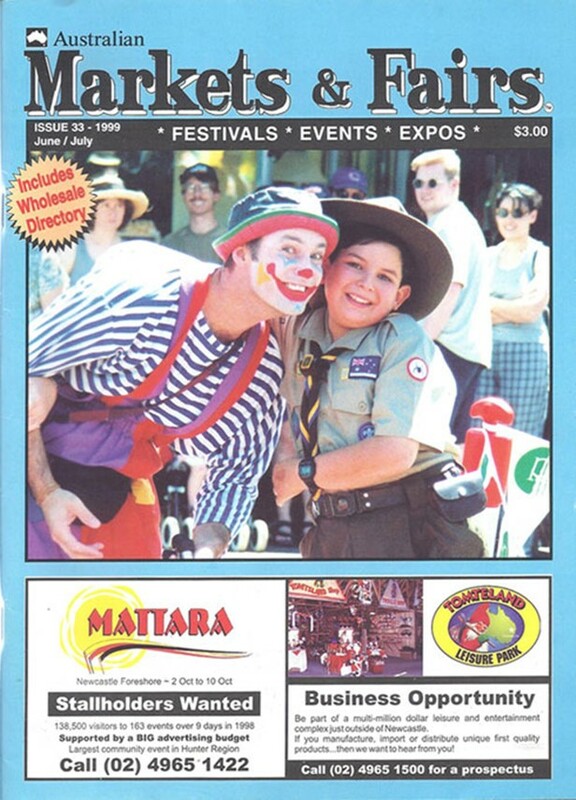 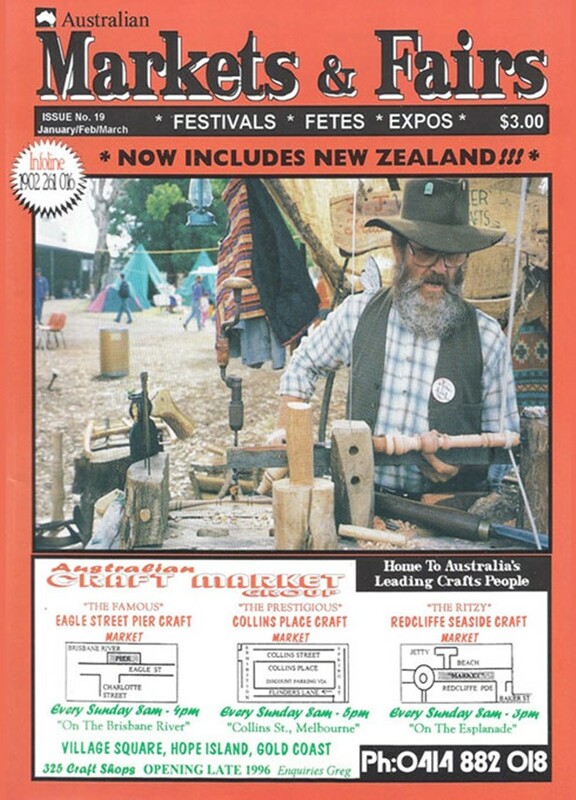 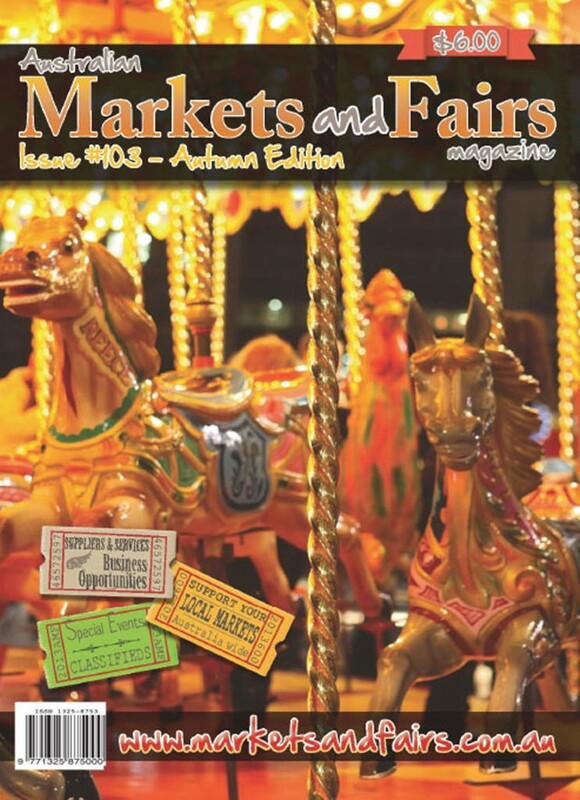 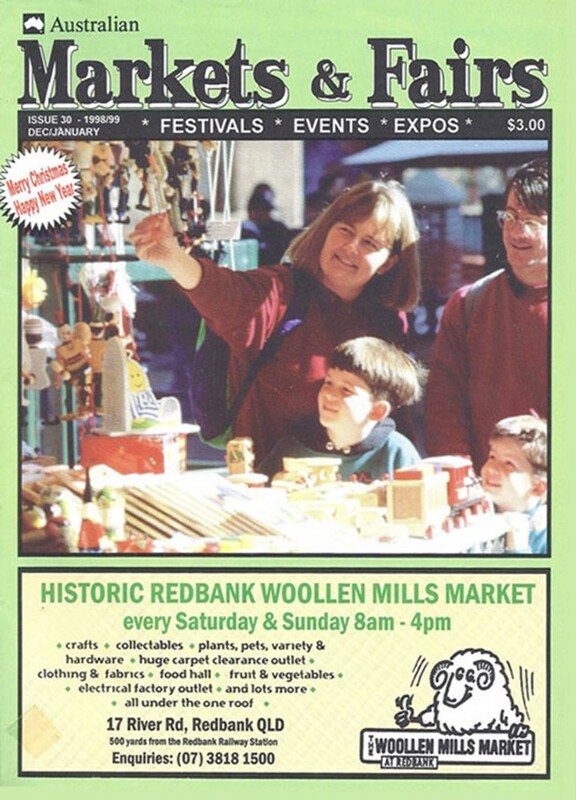 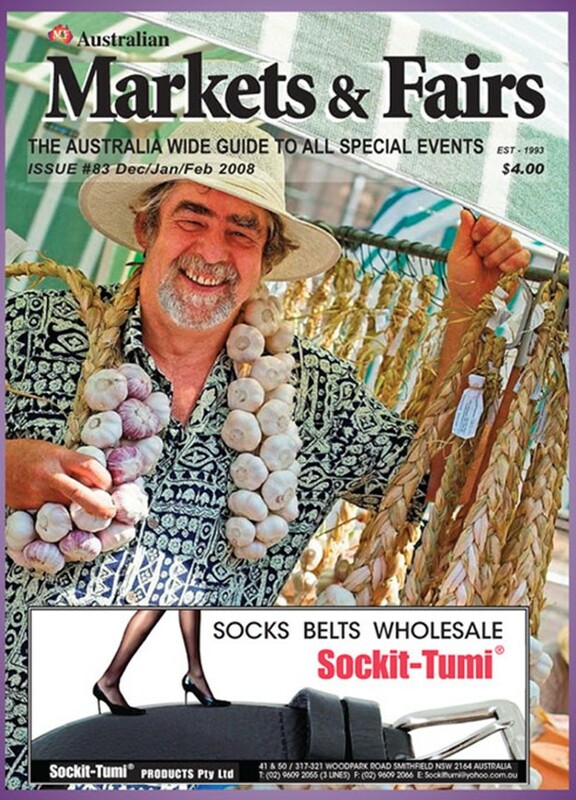 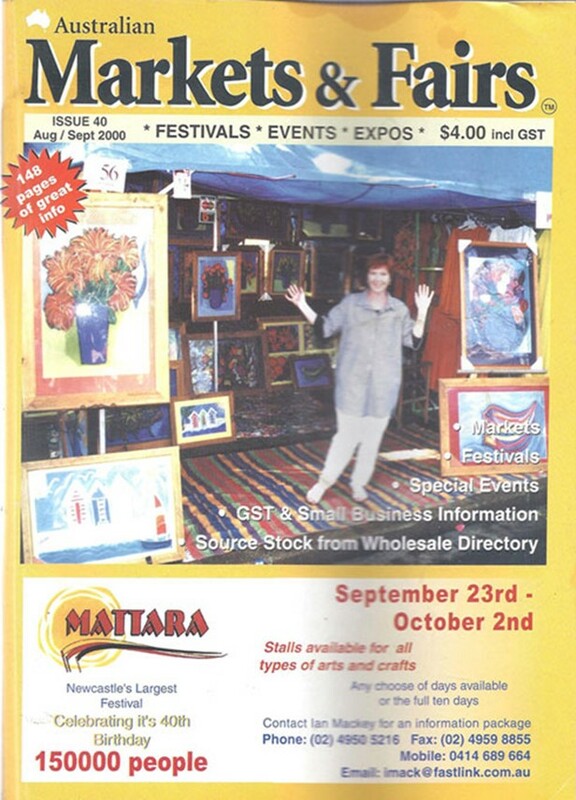 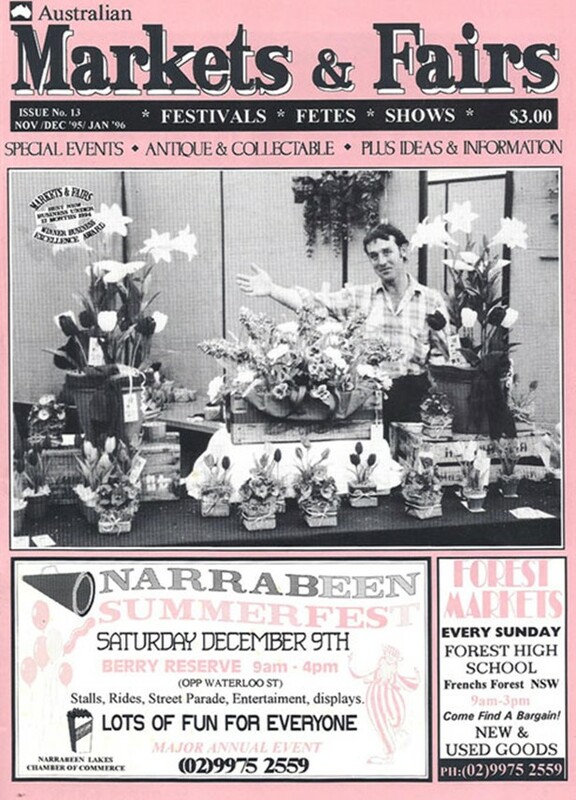 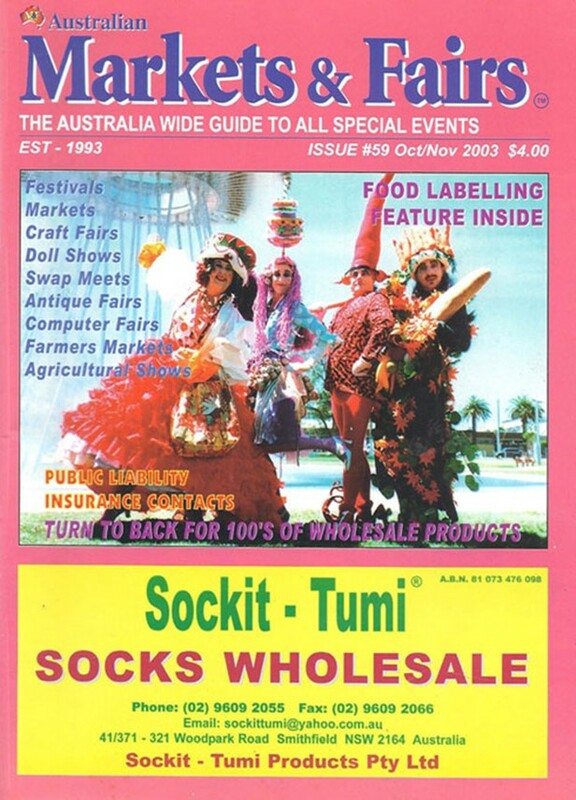 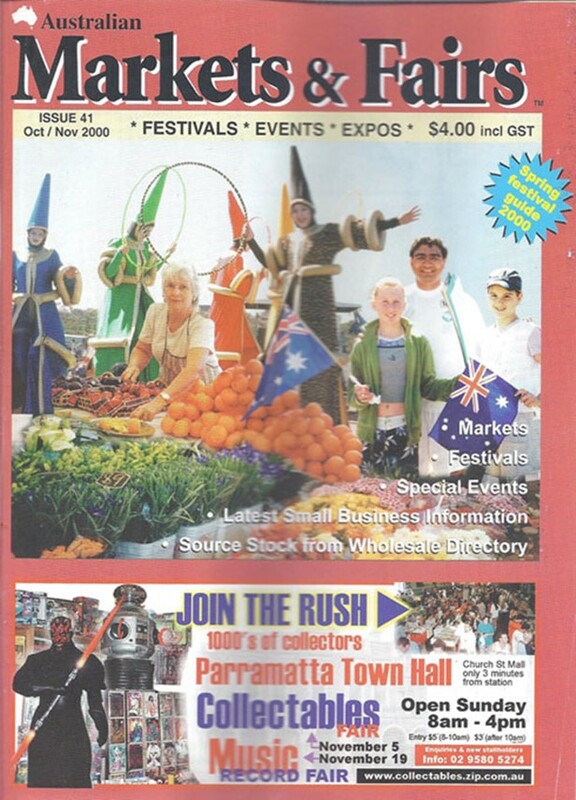 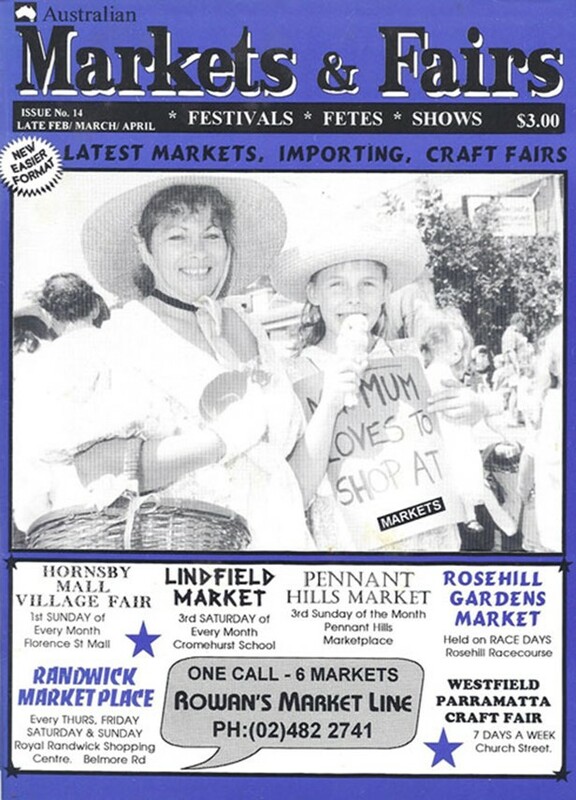 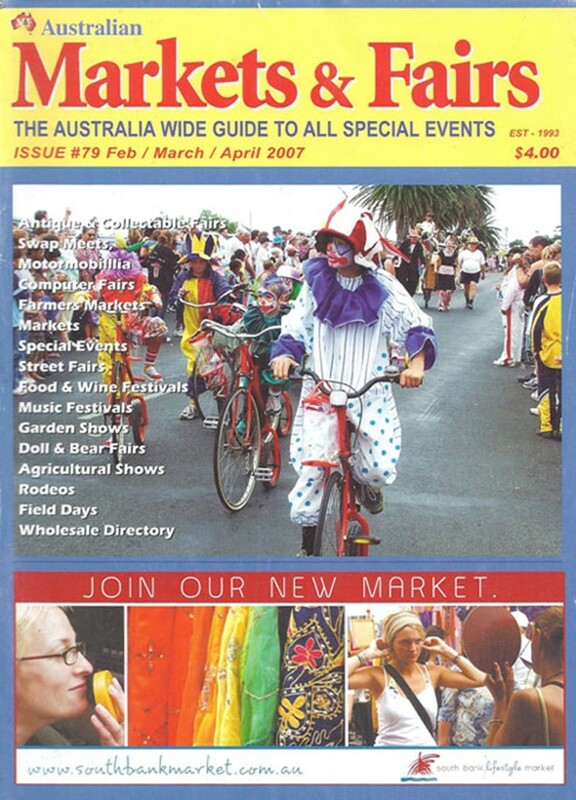 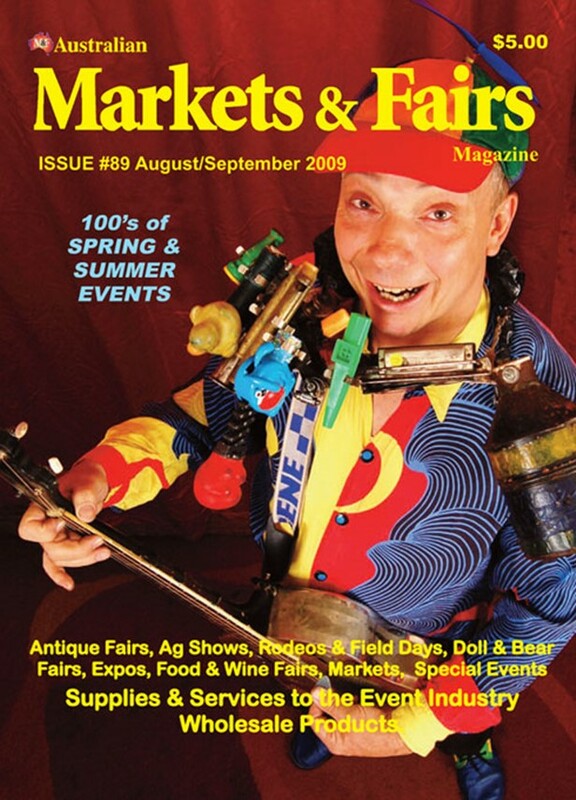 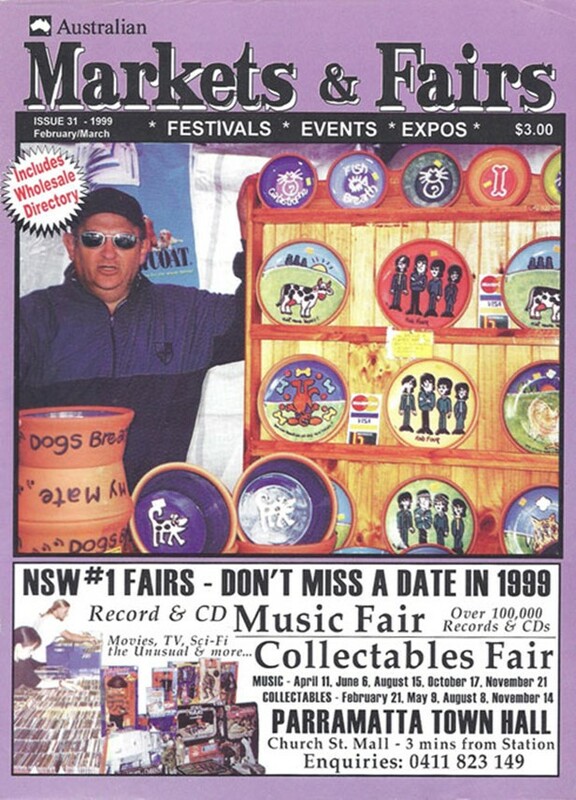 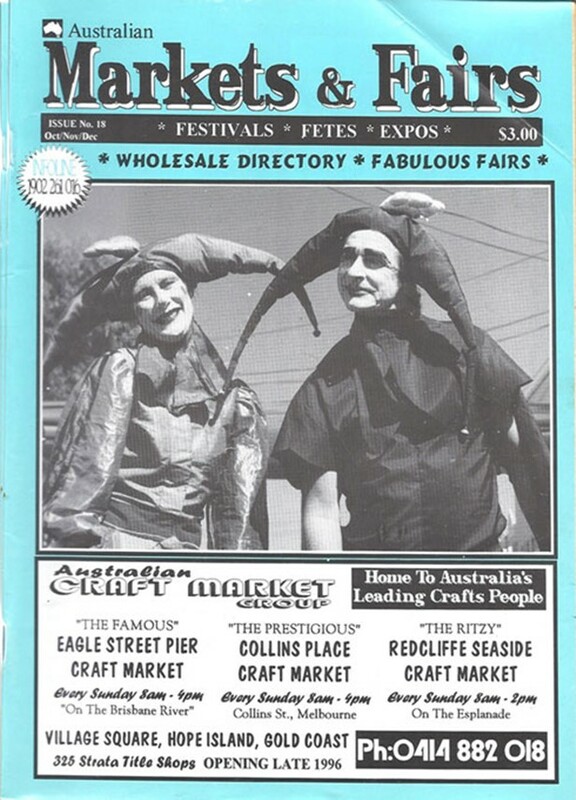 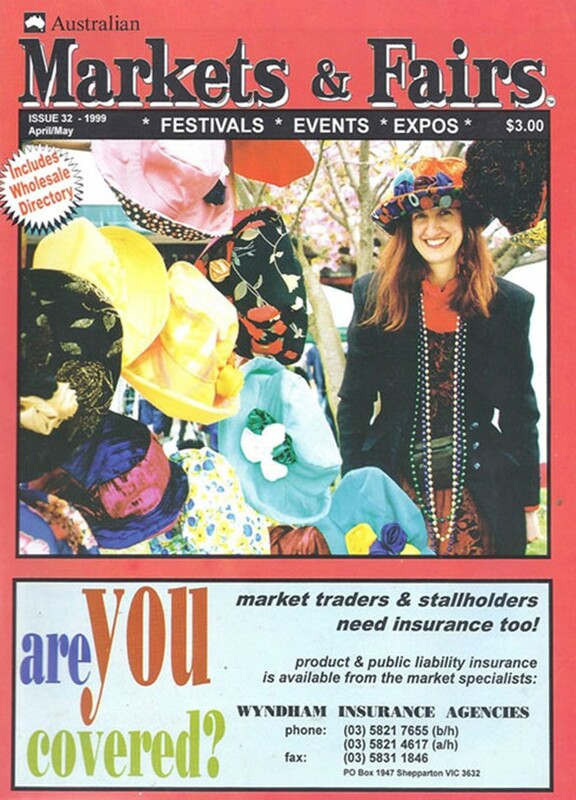 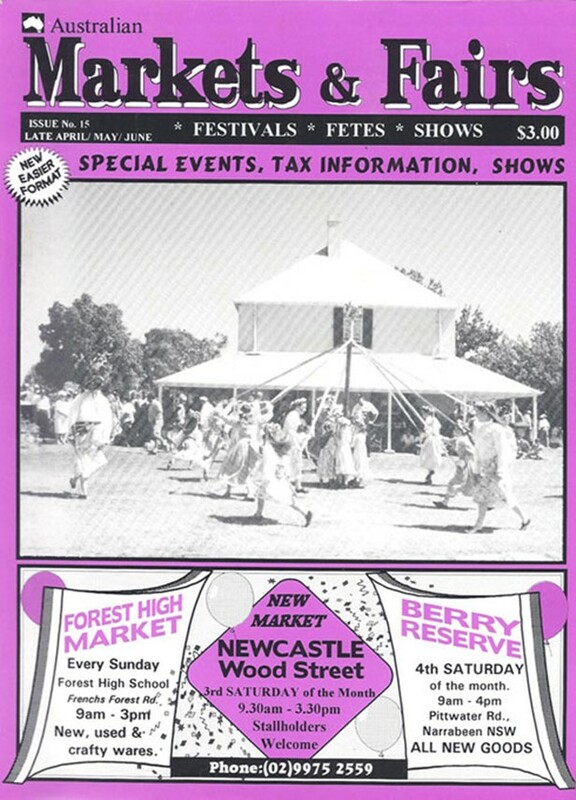 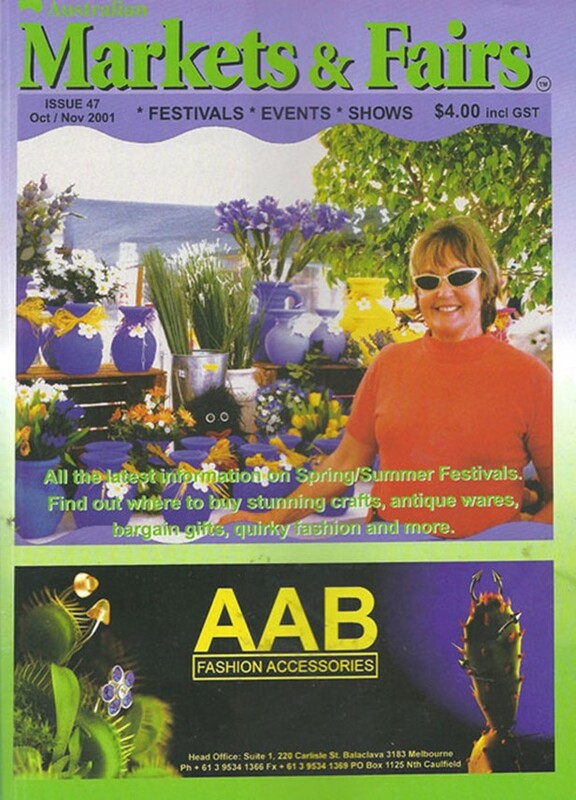 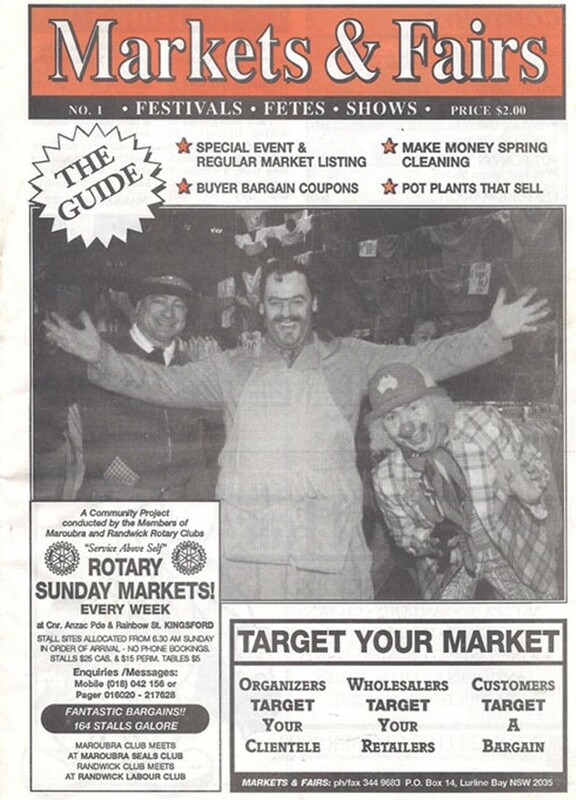 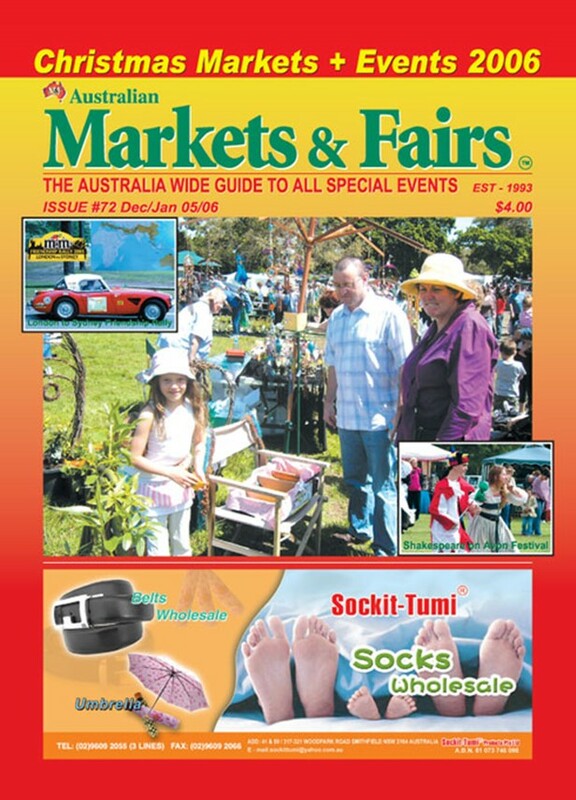 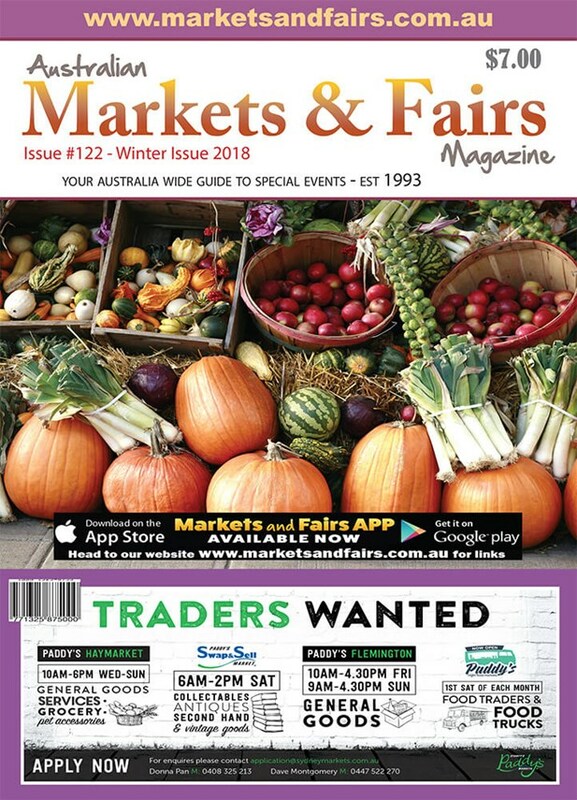 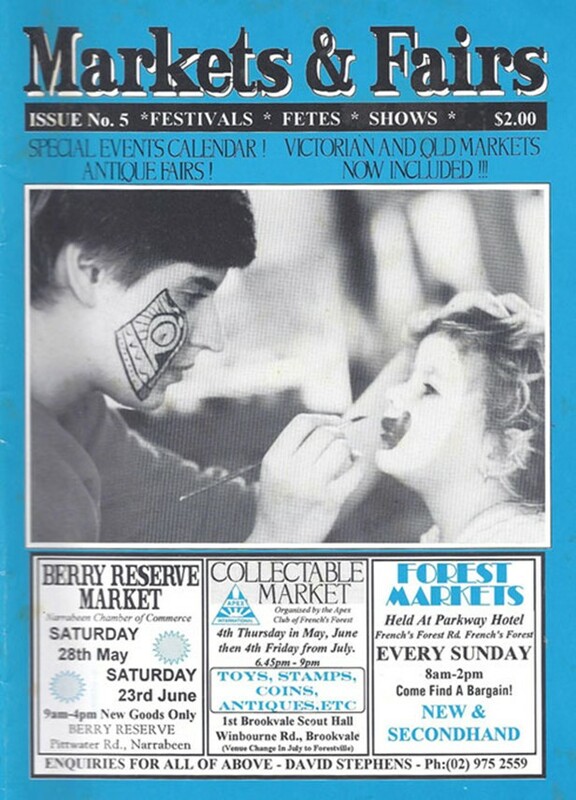 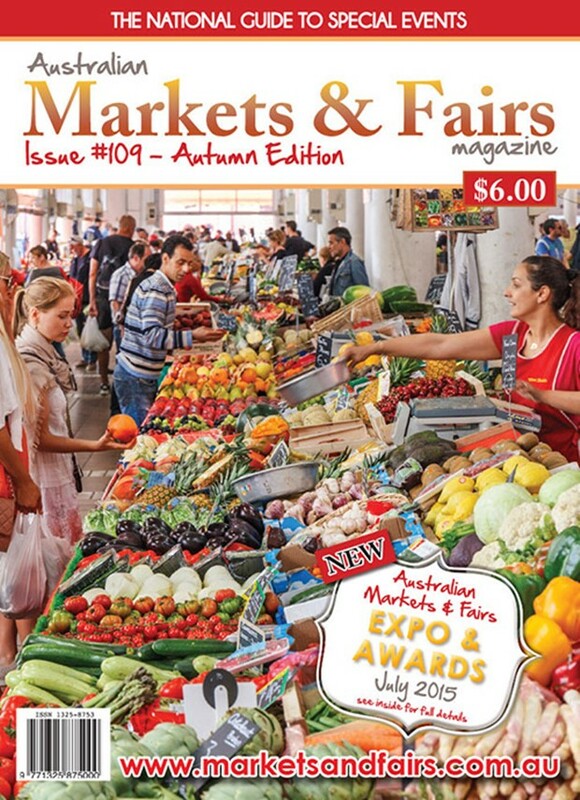 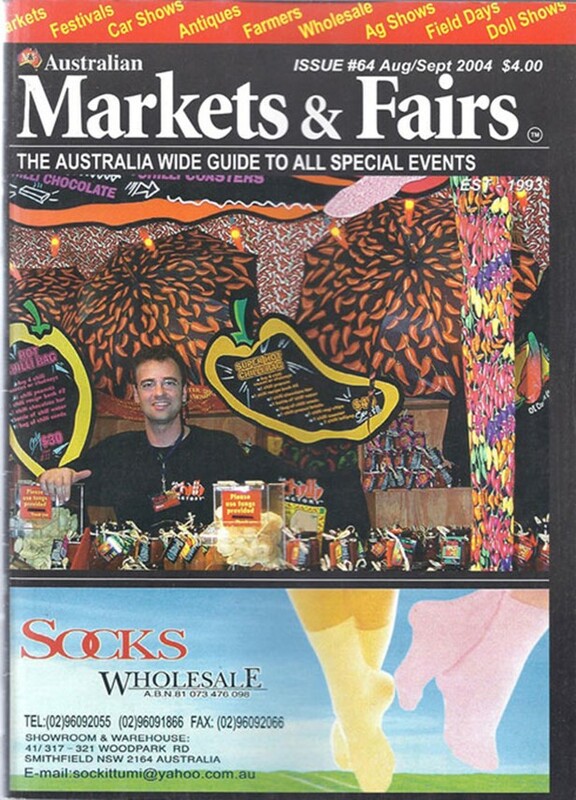 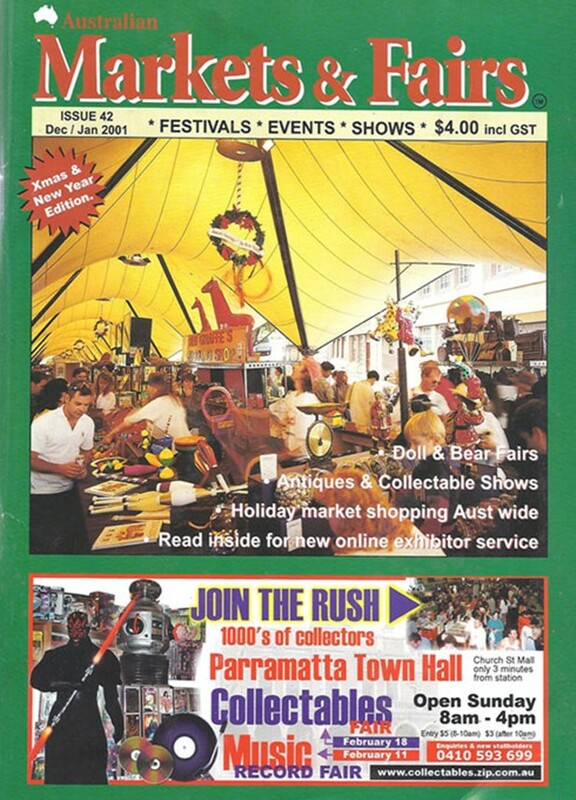 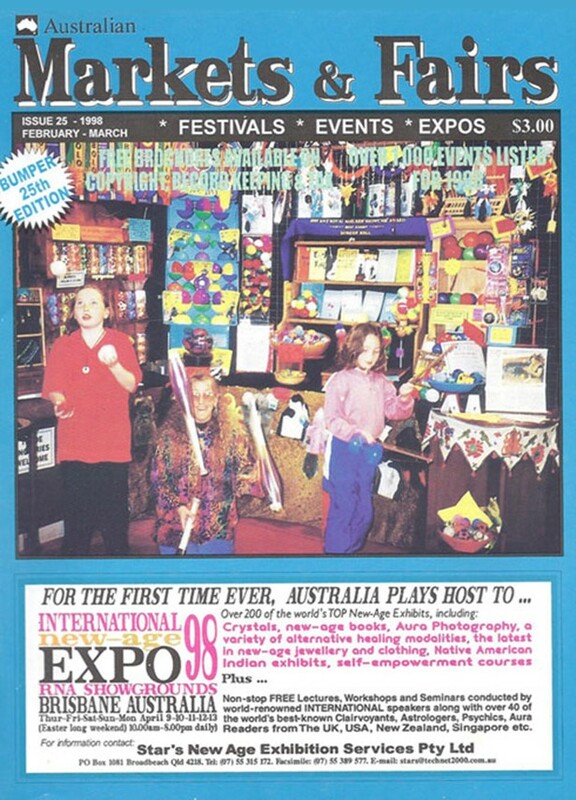 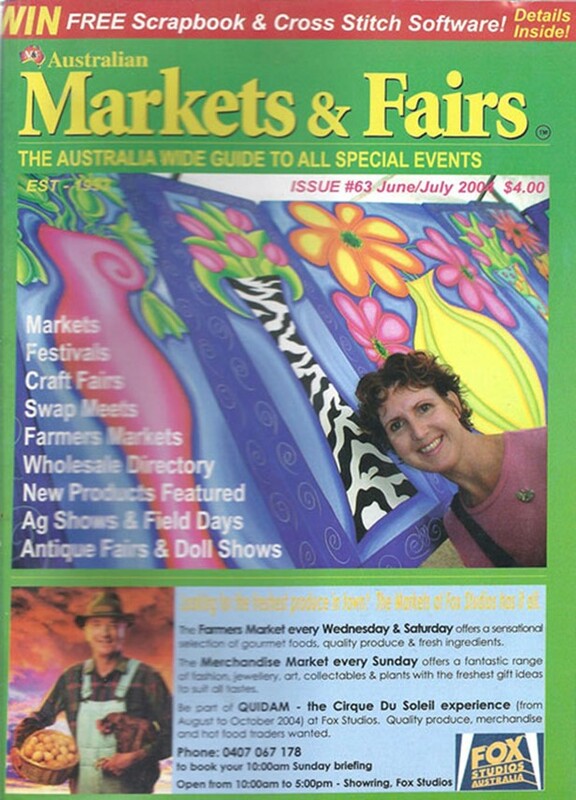 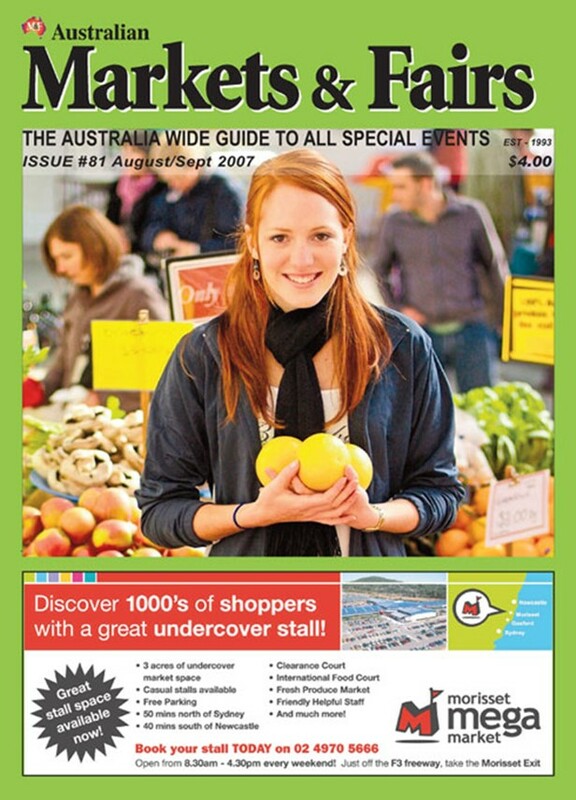 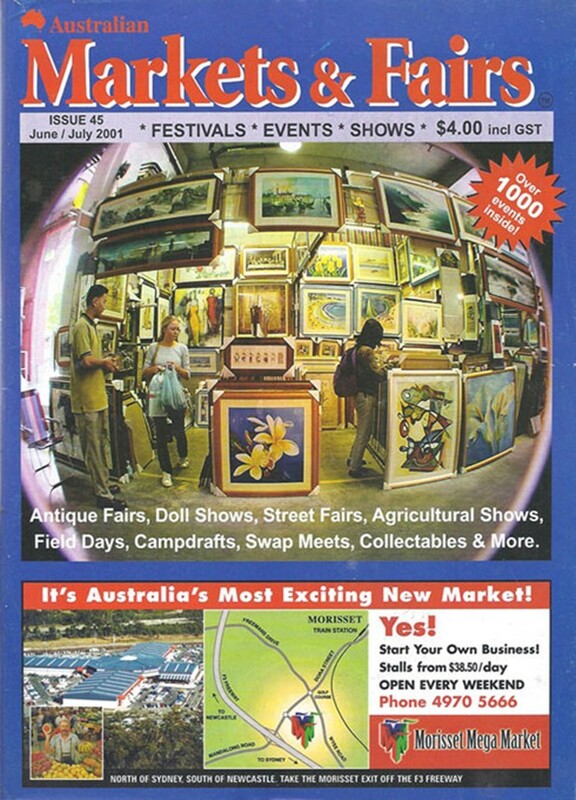 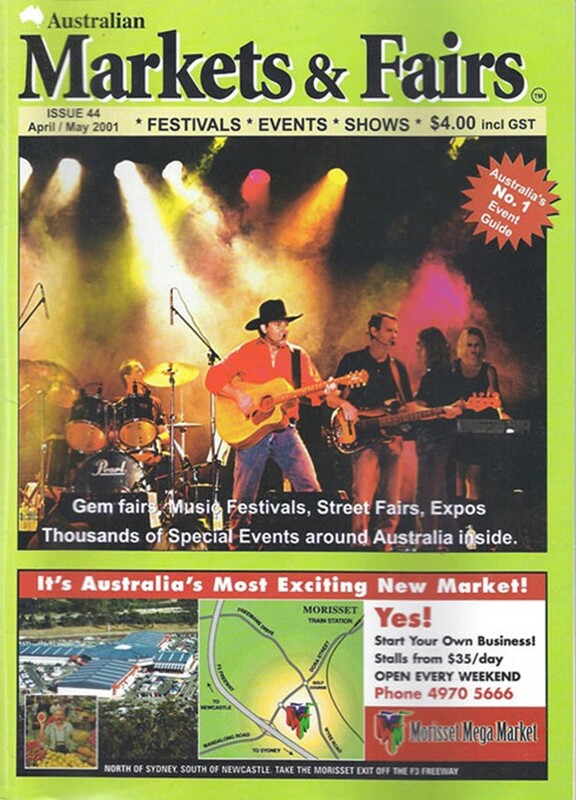 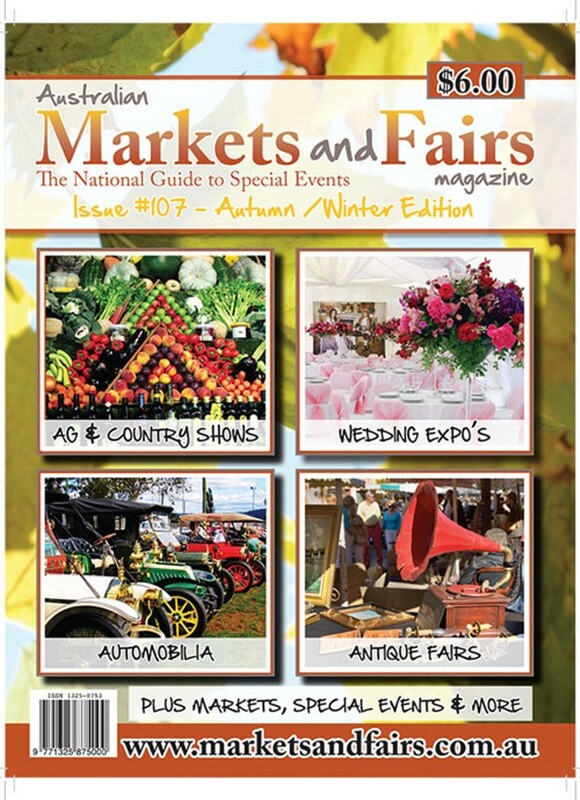 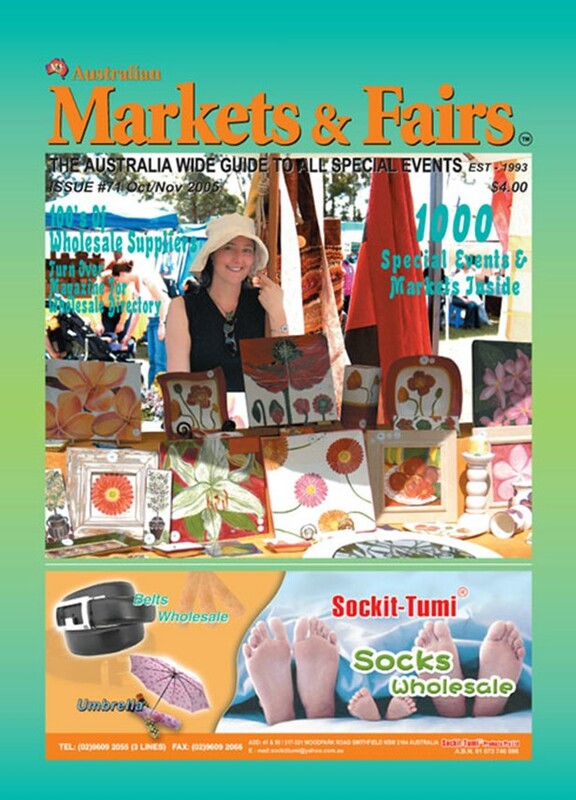 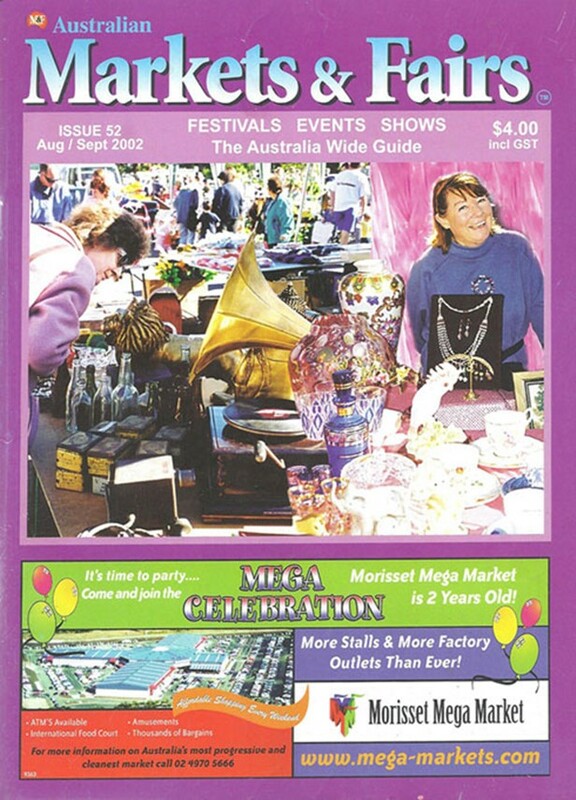 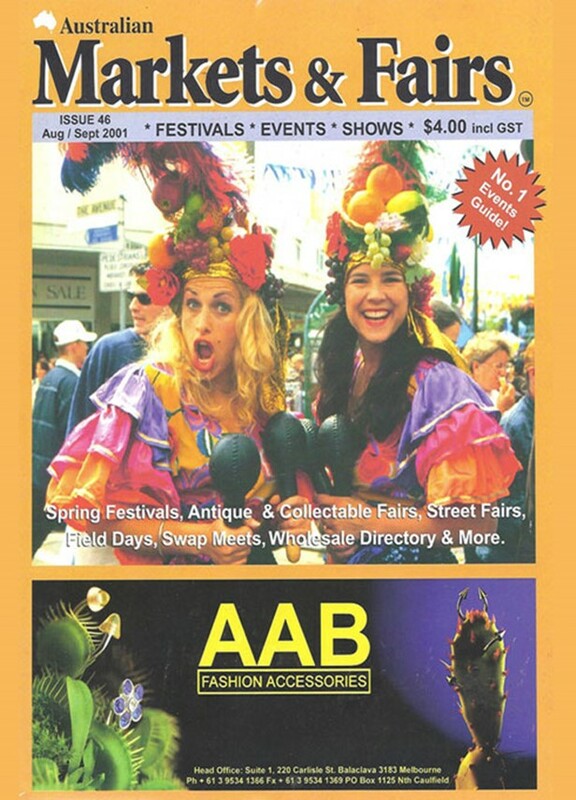 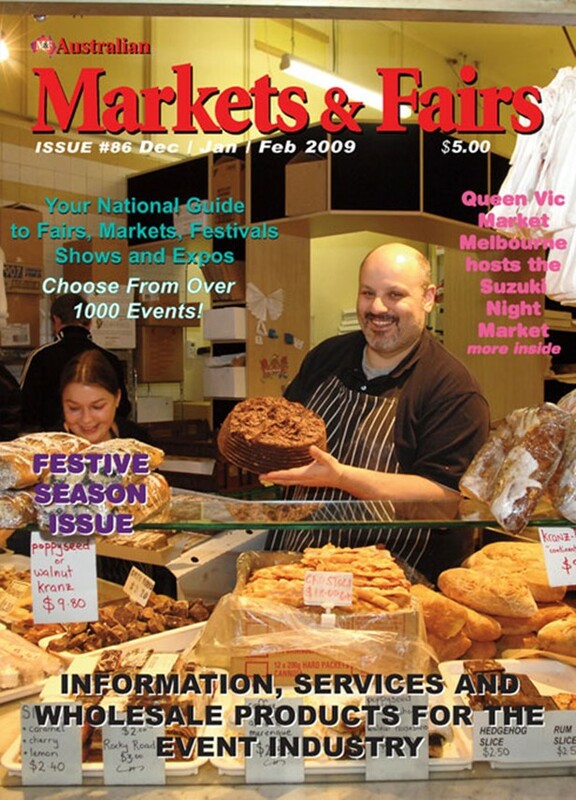 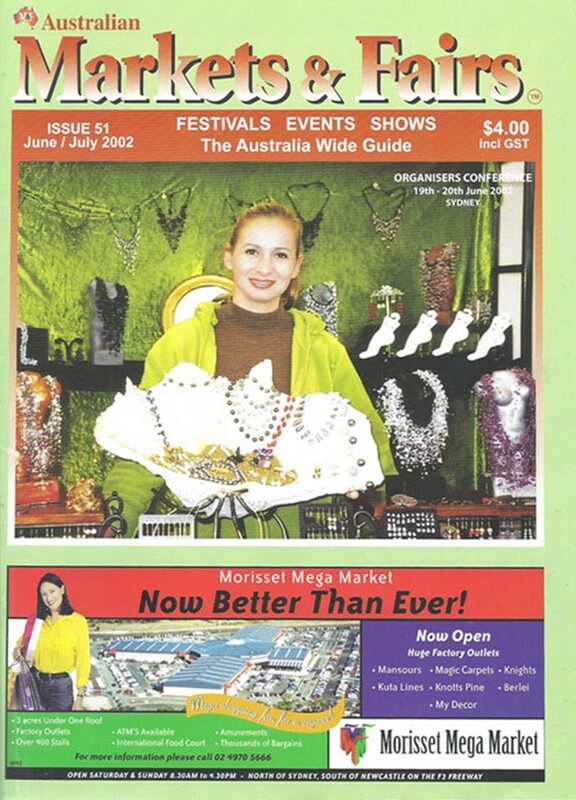 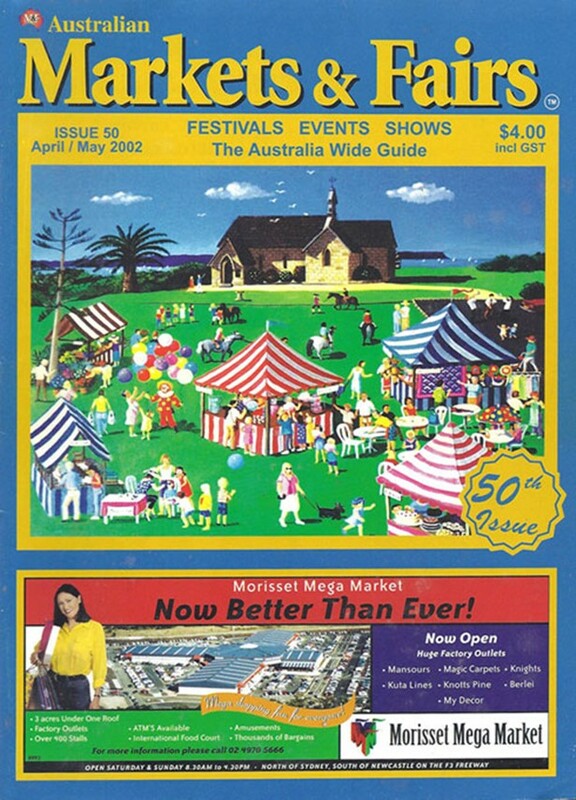 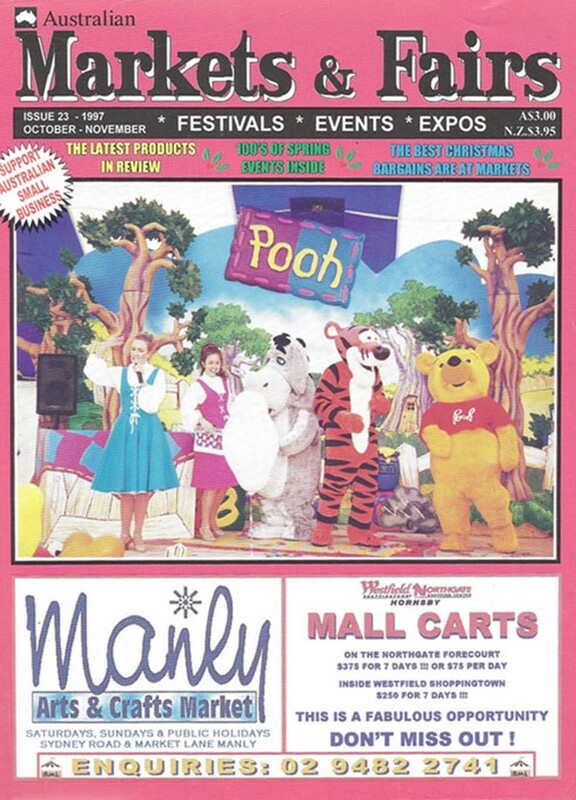 Australian Markets and Fairs Magazine started off on the 3rd of October 1993, with a 16 page black and white NSW guide of Markets and Events in the Sydney region for as little as $2.00. 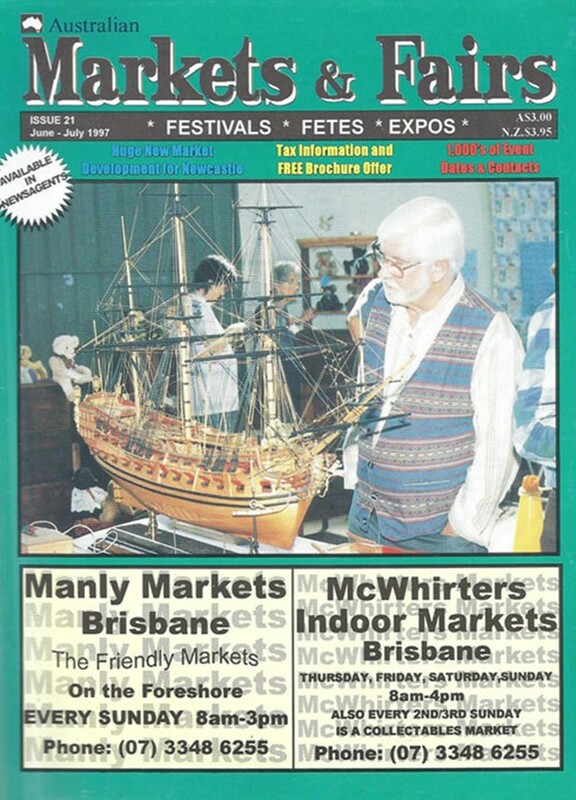 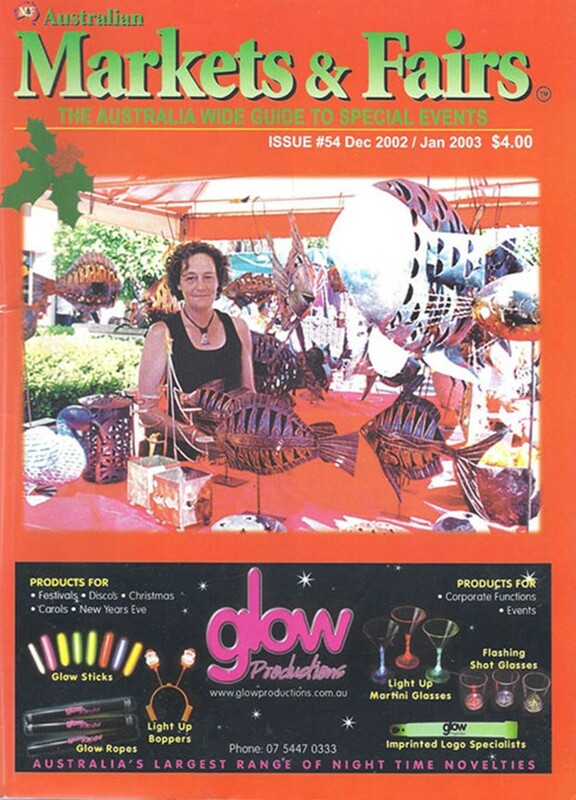 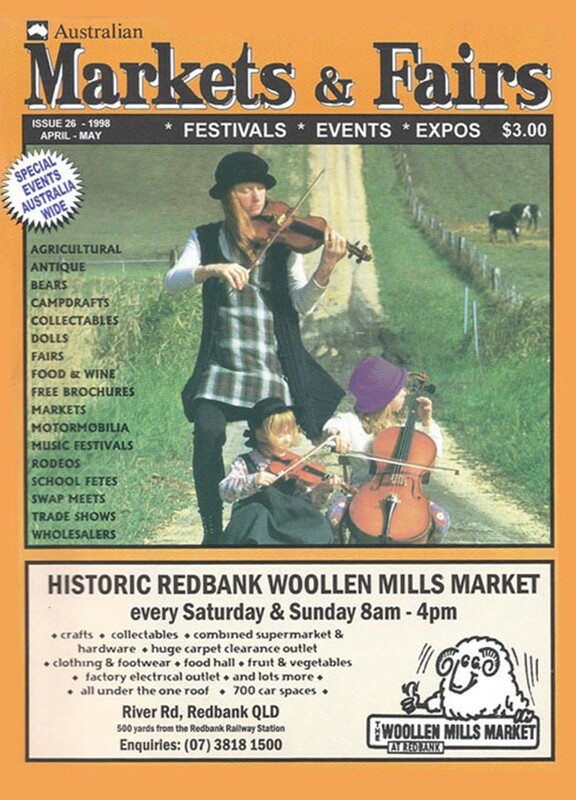 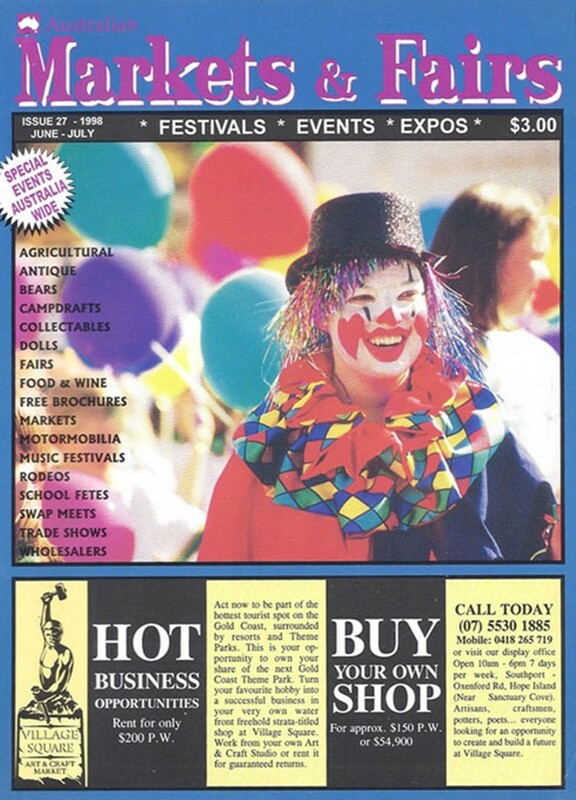 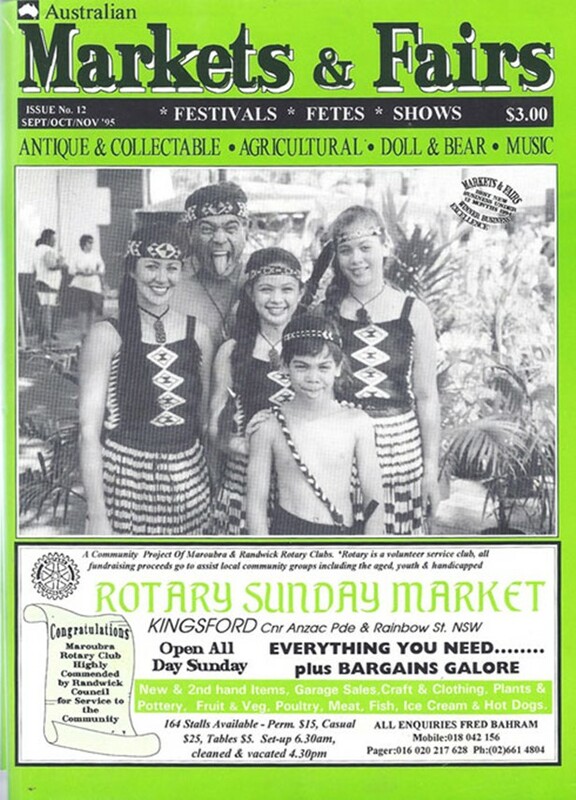 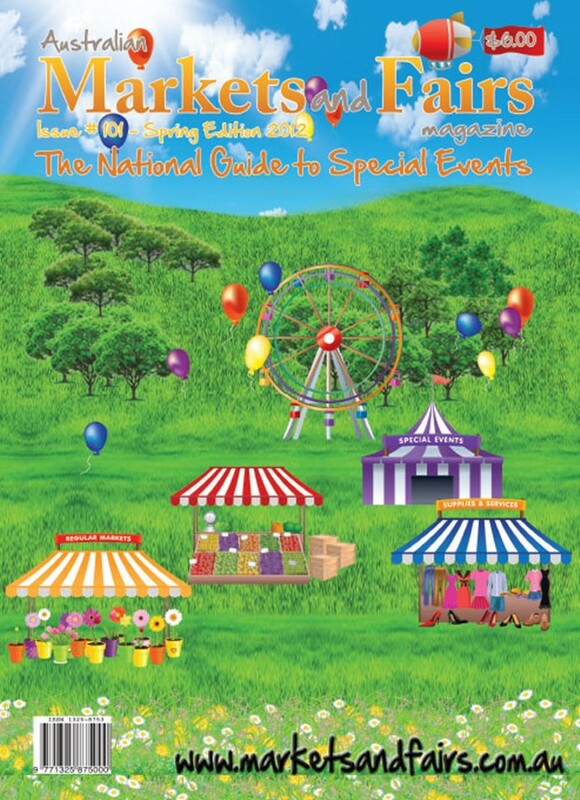 Within its first year Markets and Fairs had grown to 100 pages, started printing a colour gloss cover with a handful of spot colour adverts ( reds and blues) , expanded to Queensland and Victoria, and not to mention won the local Best New Business Award in 1994. 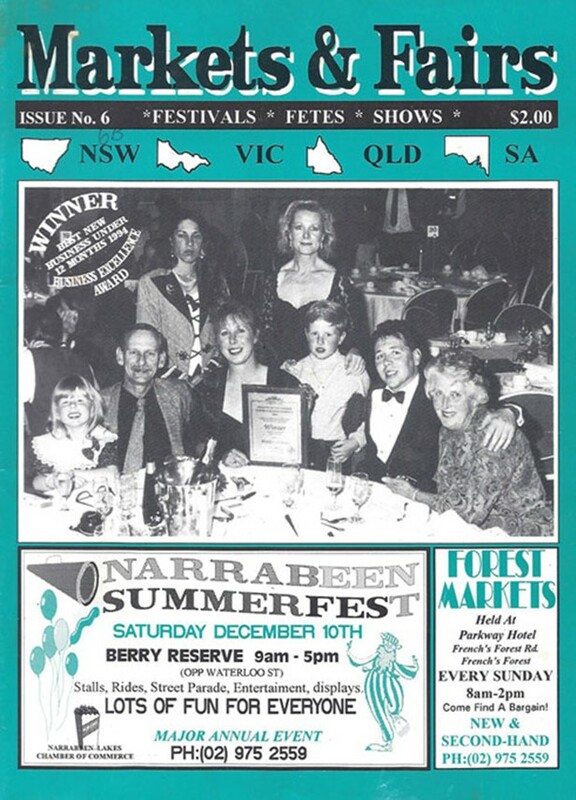 Wow what a year! 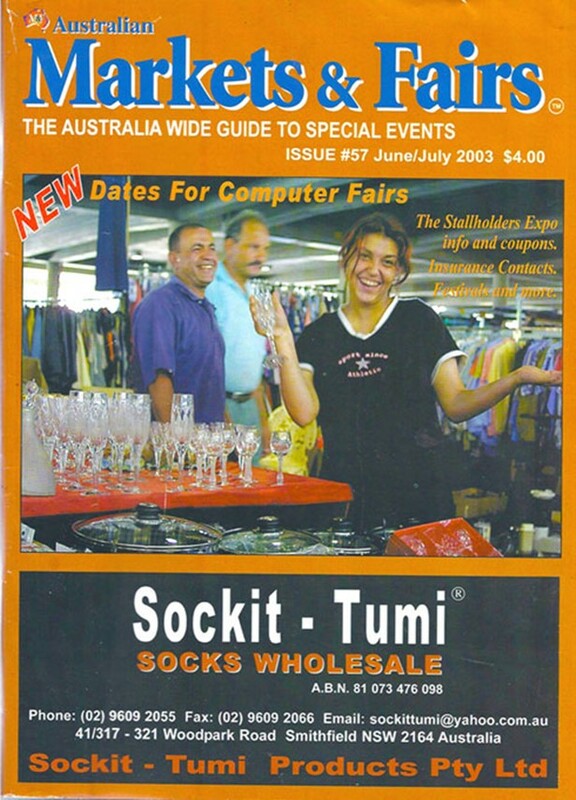 Within 18 months the Magazine was nation wide and 144 pages. 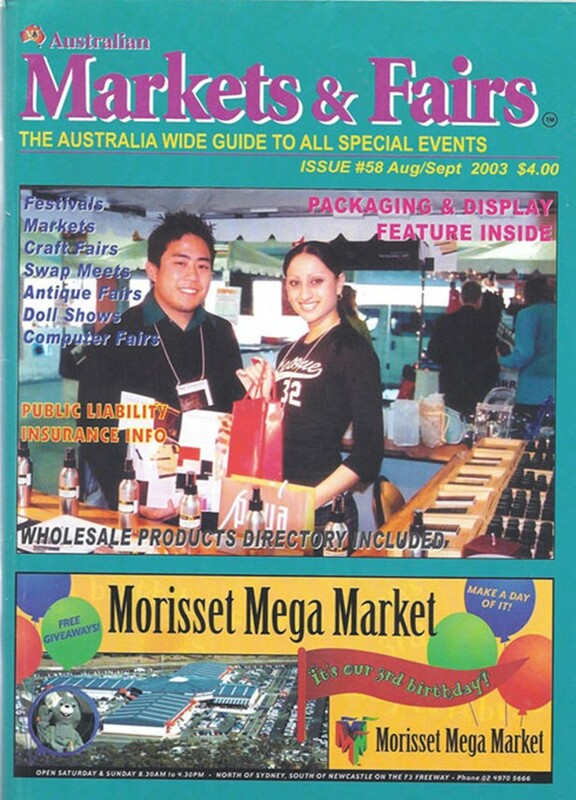 In 1999 Markets and Fairs won the Telstra and New South Wales Government Small Business Award for Commonwealth Micro - Business of the year. 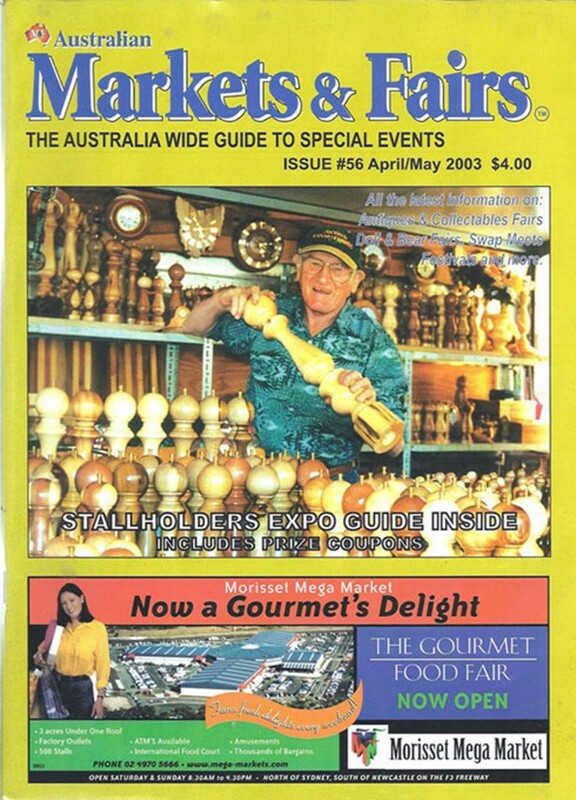 With only entering two business competitions and winning both and with many famous Australian faces appearing in the magazine through out the 90's some of those include Angry Anderson, Kostya Tzyu, The Honourable Mr Olsen Premier of South Australia and The Honourable Robert Carr M.P Premier of N.S.W. 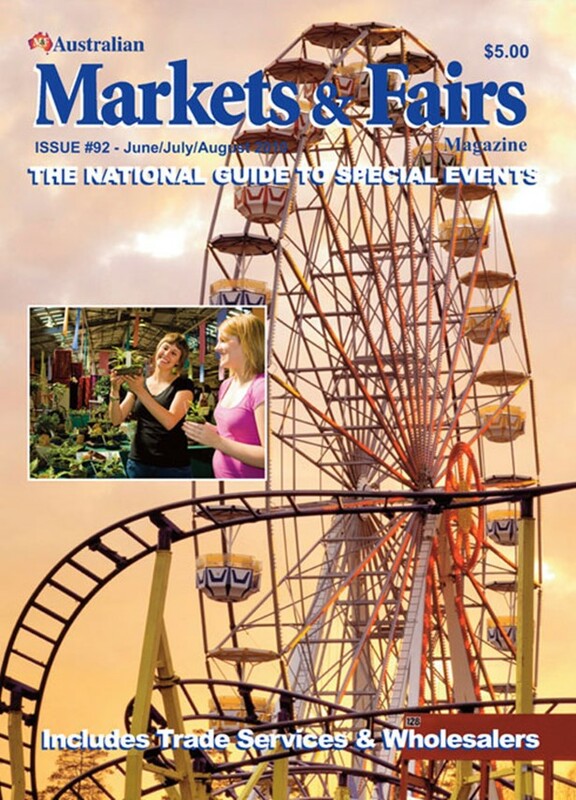 It was clear that Markets and Fairs was well on the way to becoming the only comprehensive guide to markets and events nationwide. 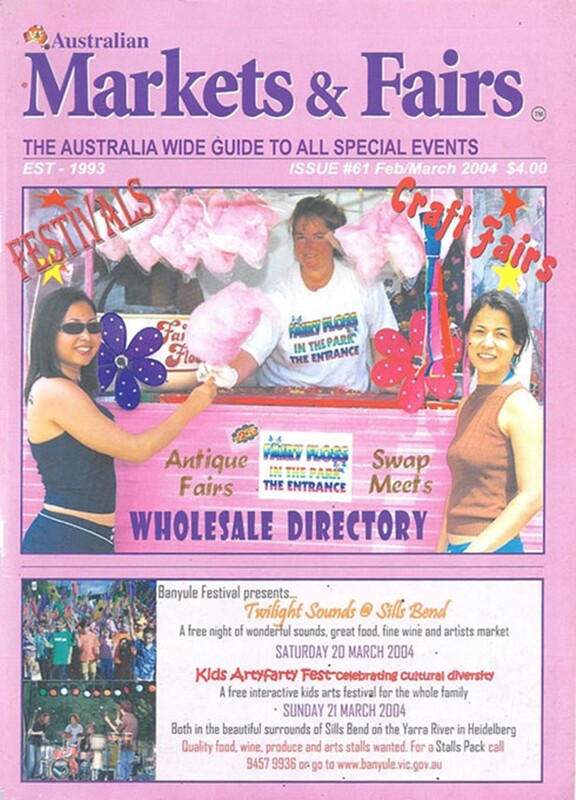 By the early 2000's, Markets and Fairs had started printing full colour adverts on particular pages through out the magazine. 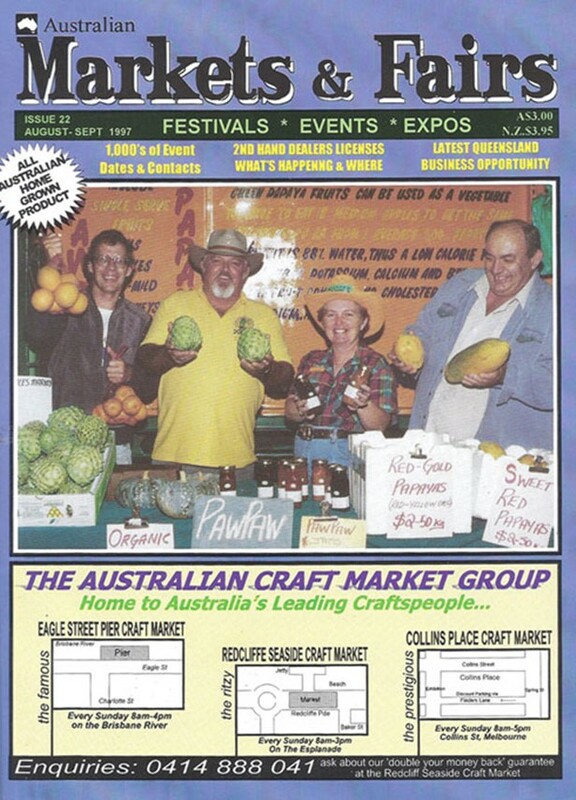 In March 2010 APN Print became the magazine's new printers and Markets and Fairs took a giant step forward with full colour adverts appearing more frequently on the pages of the magazine. 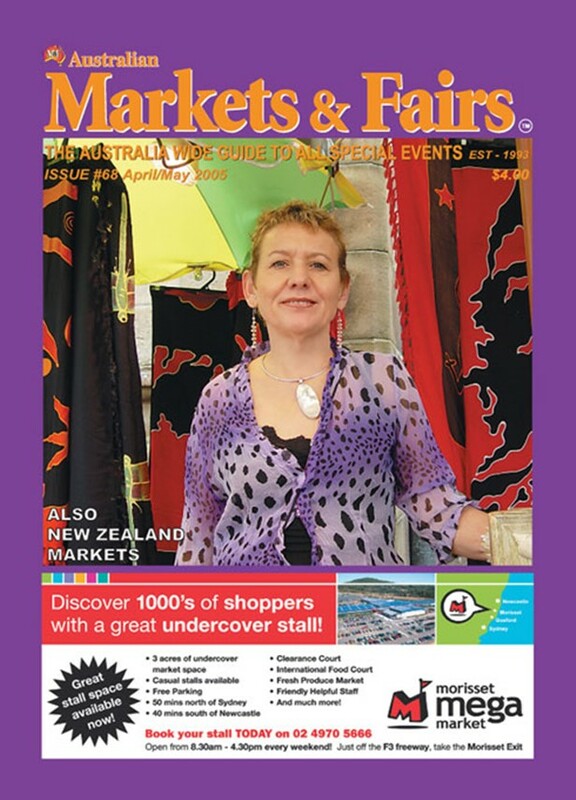 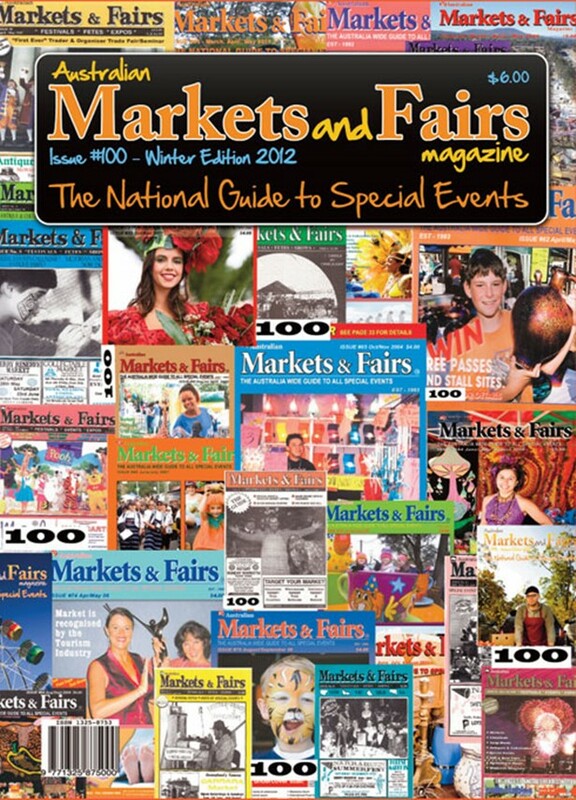 By 2011 Markets and Fairs Magazine had a readership of 34,000 readers and had introduced four gloss pages to then 144 page magazine and was still the only one of its kind on the shelves. 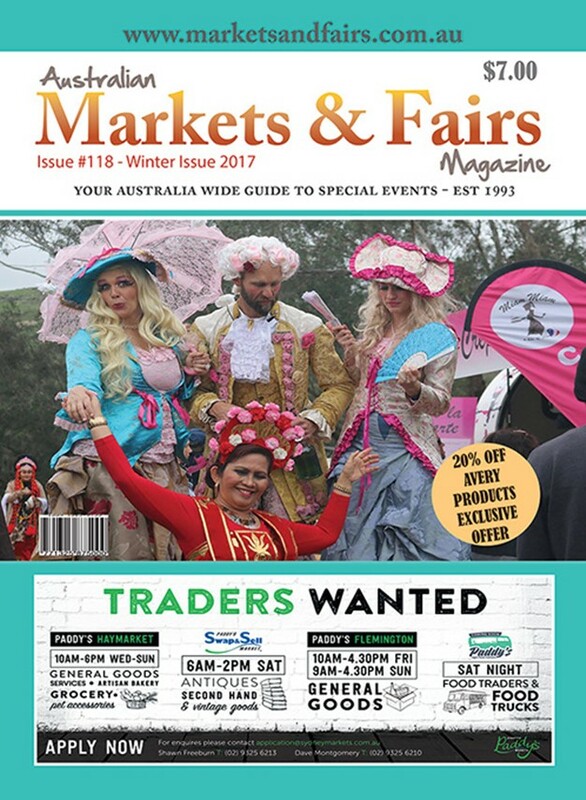 Now fast forward to 2018 and the magazine is still gracing the shelves of newsagents Australia Wide, we have slimmed the magazine a little now being 124 pages and with 16 pages of gloss included in the cover section. 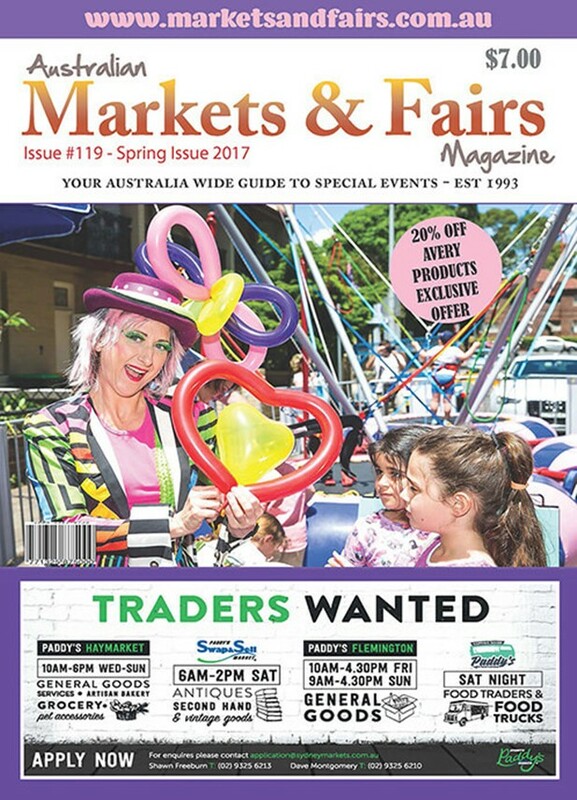 We are now printed by Spotpress in Sydney who have been printing for decades and have a great reputation for meeting delivery times. 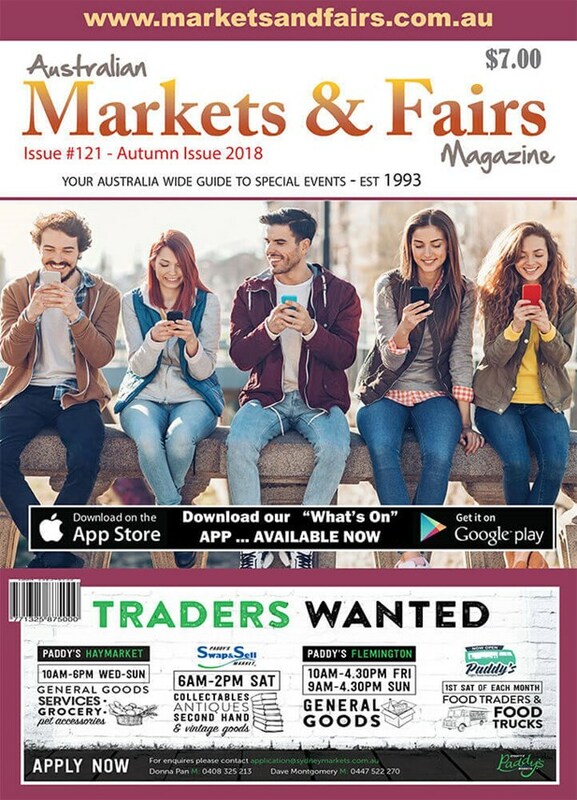 In 2018 we are also excited to launch a brand new website to take over our current one on 1st March in conjunction with launching our first ever APP - it is a Whats On APP with features relevant to the general public, organisers and traders.